Impact of Transit Influences of Planets; Systems' Astrologer, Astrology121online.com; Astrology121forU.com; Indian Astrologer teaches application of Astrological Remedial Measures. "Indian Astrologer. Famous Indian Vedic Astrologer, Indian Astrologer - V K Choudhry guides on progeny matters, Learn Astrology with Indian Astrologer, Learn Predictive Astrology with Indian Astrologer, Advance Predictive Techniques by Indian Astrologer, Birth Chart Reading, Know Business Corporate Astrology with Indian Astrologer". "IDENTIFYING SIGNIFICANT EVENTS THROUGH TRANSIT IN ASTROLOGY - CASE STUDIES"
Based on the natal chart, only general trend predictions can be made while for identifying the significant events periodical contacts with learned astrologers are a must. The close conjunction/aspect of the lord of the sixth house to other planets and/or most effective points of other houses generates ill health, disputes, theft, fire and debts pertaining to the significations of the planets/houses involved. This is true both for natal and transit influences. The close conjunction/aspect of the lord of the eighth house to other planets and/or most effective points of other houses generates accidents, injuries, obstructions, delays, death of relations, trouble to father, etc., pertaining to the significations of the planets/houses involved. This is true both for natal and transit influences. The close conjunction/aspect of the lord of the twelfth house to other planets and/or most effective points of other houses generates losses, expenses, hospitalization, visits to far-off places, etc., pertaining to the significations of the planets/houses involved. This is true both for natal and transit influences. The significant events are triggered by the interplay of the relationship between transit planets and natal planets/MEPs. The results generated depend upon the significations ruled by the planets involved, the significations ruled by their mooltrikona houses, the significations ruled by their houses of placement, either natally or in transit, and/or the significations ruled by the natal house(s) whose MEPs are under transit impact. This is called the triple transit triggering influence (TTT) as it is true for the three possible combinations of transit influence i.e. transit over natal, transit over transit, and natal over transit. The result of a particular house will be influenced by a transiting planet when it is near to its most effective point depending upon its functional nature whether benefic or malefic. Considering the triple transit triggering influence, the benefic or malefic impact of transit planets is to be seen on all natal and transit planets, including functional malefics and functional benefics, and the benefic or malefic impact of natal planets is also to be seen on both transit functional malefics and transit functional benefics. The things governed by the planets would be their general and particular significations. Similarly, when the impact is on the most effective point of any house, the significations of the house occupied and house(s) aspected would be influenced by the transiting planet. Male born 1st December, 1948, 1600 Hrs. 28N39 77E13, India. The sign Aries rises in the ascendant and Mercury, Rahu and Ketu become functional malefic planets. Mars ruling the personality in general, health and general status is weak as it is debilitated in the navamsa chart but is closely under the benefic influence of Jupiter. Nevertheless, Mars is also under the close malefic influence of Rahu. The Moon ruling mother, education, assets, vehicles, domestic peace and confidence is weak as it is placed in its sign of debilitation and is badly placed in the eighth house. The Sun is weak as it is badly placed in the malefic house ruling obstructions. Mercury ruling sound financial position, good health and protection against losses through theft, fire and disputes and cheating is weak as it is badly placed in the chart. Venus ruling partners in life and partners in business, vitality, comforts and life in foreign lands is strong and placed in its own mooltrikona sign, causing Malavya yoga which blesses the native with financial affluence and comforts. Jupiter ruling fortune, father and life in foreign lands is strong and placed in its own mooltrikona in the ninth house. Rahu closely aspects Mars and makes the native highly activated as per the traits of Mars. The onset of Venus main period turned the native into a pleasure seeker which resulted into his venturing to consume drugs and finally getting addicted to drugs. On the other hand strong Jupiter and strong Venus had the potential for bringing fortunes to the native. Due to the availability of finance, the native could keep his family going in spite of persistent spoiled marital relations and obstructions caused by the unfavorable transits over weak natal planets. The gravity of the unfavorable transits was very severe and started telling upon his health in 1992 very badly. In fact the native had become a slave of the addiction by that time. 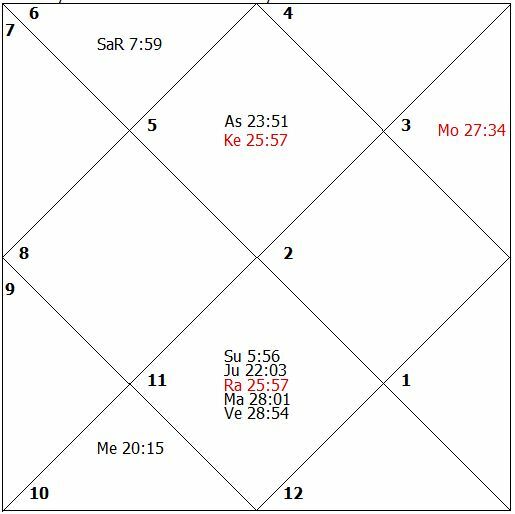 Ketu’s close transit aspect to the natal Venus and Ketu in March, 1992, widened the gulf between him and his spouse and gave ill-health to both of them. The transit conjunction of Rahu to the natal Moon, the Sun and Mercury in 1993 disturbed mental and marital peace seriously. The native had become so weak that he could not resist even the manhandling by his spouse due to the persistent conflicts. Female born 5th June, 1965, 2325 Hrs. India. The sign Capricorn rises in the ascendant and the Sun, Jupiter, Rahu and Ketu become functional malefic planets. Saturn ruling status, wealth and family is strong, placed in its own mooltrikona sign and near the most effective point and favorably influences all the houses aspected, as well. Mars ruling mother, education, assets, vehicles, domestic peace and confidence is weak as it is badly placed in the eighth house. The Moon ruling partners in life and partners in business, vitality, comforts and life in foreign lands is weak as it is placed in the malefic eighth house ruling obstructions. Mercury ruling fortune, father and life in foreign lands is weak as it is combust and is closely afflicted by the functional malefic planet, Jupiter. Venus ruling the house of profession and fame is weak as it is badly placed in the chart. Jupiter ruling the house of losses, expenses and smooth marital relationship is combust and is closely afflicted by Rahu-Ketu axis. The Sun ruling easy gains in life, inheritance, interest in mystical sciences, marital tie and obstructions is closely afflicted by Rahu-Ketu axis. Due to the weakness of majority of the planets, the native faced so many problems in life besides ill-health. 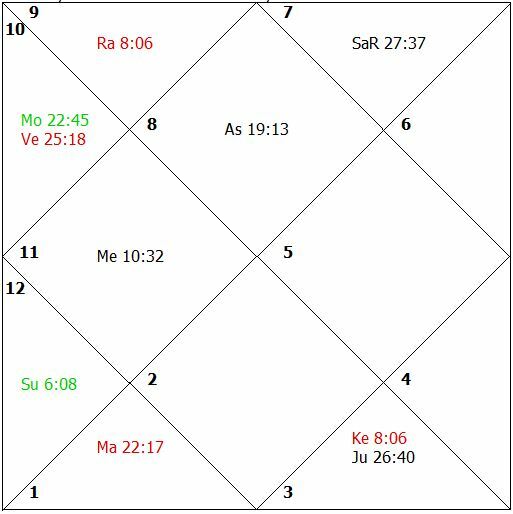 In July, 1989, when the transit Rahu and Jupiter had formed close aspect and conjunction, respectively, with Venus in the sixth house the native had to go in for surgery for removal of the appendicitis. 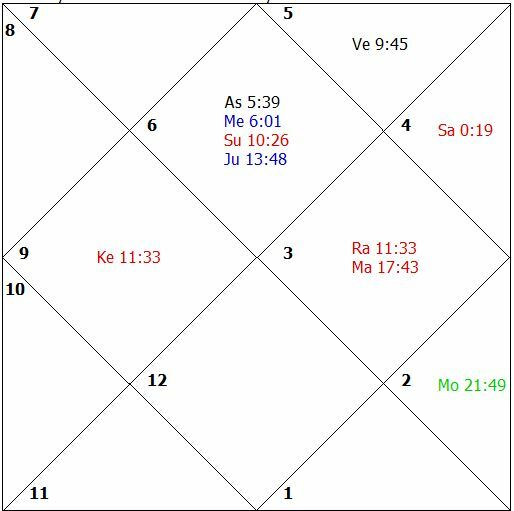 In this continued close impact of Rahu and Jupiter to the natal Venus, the native had to go in for a caesarean operation which turned septic and kept the native in the bed for a period of over three months. From May 13, 1992, the main period of the Moon started and coincided with the transit of Jupiter over the natal Moon in the eighth house. The husband of the native due to his ambitiousness went to a foreign country causing painful separation to the native. On 2nd June, 1995, while transit Jupiter formed exact aspect to the natal Jupiter and closely influenced the natal Sun, Rahu and Ketu, the transit Jupiter came simultaneously under the affliction of all the natal functional malefic planets, Jupiter, Rahu, Ketu and the Sun, and under the affliction of the transit Sun. Simultaneously, the transit Sun was not only afflicted by transit Jupiter, but fell under the affliction of all the natal malefic planets. The native had to be hospitalized for over two weeks due to high blood pressure during the course of a pregnancy in an advanced stage. The life of the baby was also threatened. As the native was performing astral remedies under the guidance of the author she could come out of this illness without any damage to the child. Due to close conjunction of the Sun with Rahu, as observed earlier, the native, too, suffered on account of ill-health of father, ill-health of self, separation from her husband, etc. From 14th May, 1986, she had main period of the Sun, who is most malefic planet for the native. The native was married in 1986 but was not blessed with a male child up to 1994. With sincere performance of astrological remedial measures the native was blessed with a male child in October, 1995. Male born 14th November, 1949, 0650 Hrs., India. The sign Libra rises in the ascendant and Mercury, Rahu and Ketu become functional malefic planets. The Sun ruling the house of gains, income and fulfillment of desires is weak due to debilitation but it is close to the most effective point of the ascendant. The Moon ruling the house of profession and fame is weak due to the weakness of its dispositor. Mars ruling partners in life and partners in business, vitality and marriage in general in this case is well-placed but is weak due to the weakness of its dispositor. Saturn ruling the house of emotional happiness, speculation, gains from investments, progeny and higher learning is weak due to the weakness of its dispositor. Jupiter ruling initiative, the power of understanding and communication, and breathing system is weak as it is placed in its sign of debilitation and in the state of infancy. Venus ruling the personality in general, health and general status is weak due to the weakness of its dispositor. Rahu and Ketu do not cause close afflictions in the natal chart. Mercury is weak due to combustion and it causes slight affliction to the Sun and the most effective points of the ascendant and the seventh house. The weak functional benefic planets make positive contributions of a notably lower order but whenever they come into contact with slow moving functional malefic planets, they cause sufferings with respect to their significations, the house where they are placed and the house where their mooltrikona signs are placed. In this case the planets in Leo or Sagittarius become weak as the lords of these two signs are in their signs of debilitation. This has resulted into weak constitution of health for the native as well as his wife. The planets Mars, ruling the seventh house, Venus being the signification for wife and the Moon being secondary significator for the wife, all are weak. In July-August, 1989, when transit Ketu formed conjunction with the natal Moon, the wife of the native was involved in an accident and had to be hospitalized for more than a month. 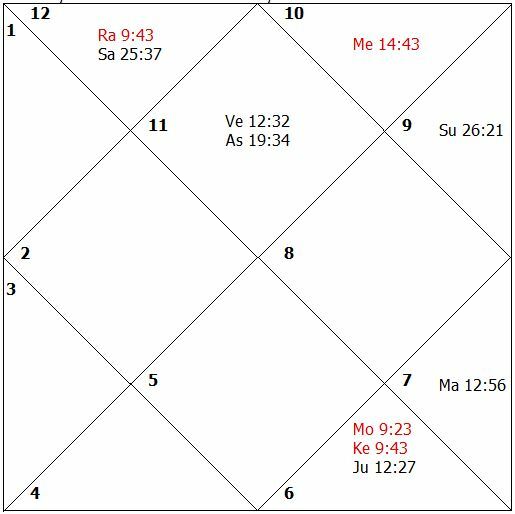 In November, 1991, to February, 1992, when transit Rahu had formed close conjunction with natal Venus and close aspect to the natal seventh lord, Mars, the native’s wife suffered from ill-health (high blood pressure) as Rahu was moving at a very slow speed. 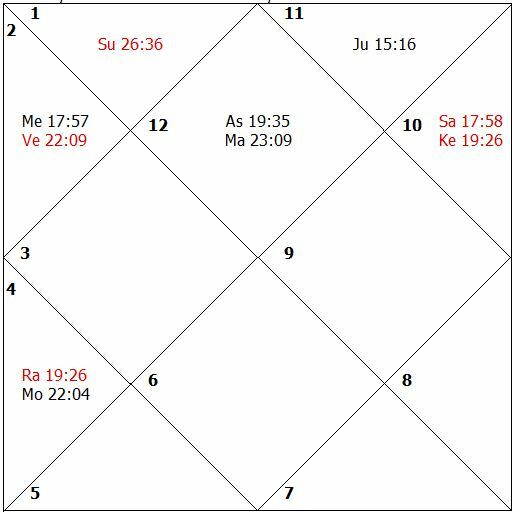 In May, 1988, when transit Rahu formed close aspect to the most effective point of natal ascendant and the debilitated Sun, the native himself was involved in an accident and had to be hospitalized. Male born 5th June, 1947, 1000 Hrs. Gurgaon, India. The sign Cancer rises in the ascendant and Jupiter, Saturn, Rahu and Ketu become functional malefic planets. So the Sun, Moon, Mercury, Mars and Venus are the functional benefic planets. The lord of the ascendant, the Moon, is in the sixth house. Mercury ruling initiative, entrepreneurial nature, courage, the power of understanding and communication, valor, younger brothers and breathing system is in the twelfth house. Venus ruling mother, education, assets, vehicles, domestic peace and confidence is exactly aspected and afflicted by the lord of the sixth house indicating losses, disputes and debts in connection with the assets of the native. Mars ruling the house of profession, happiness through male progeny and fame is near the most effective point of the tenth house and closely aspects the ascendant, fourth and fifth houses. The native, who is in the service of the state, ventured into a part-time business by investing capital borrowed against his assets. The venture did not bring the desired profitability and had obstructions and losses. The native in addition to his indifferent general health had severe health problems, too. In May-June 1979, when transit Rahu closely influenced the most effective point of the second house with aspect to the sixth house, eighth house and Venus followed by Saturn’s close aspect to the natal Sun and the mutual malefic aspect between transit Jupiter and natal Ketu, the native had severe typhoid and almost had a rebirth. The transit malefic influences had touched many natal points, simultaneously. In another incident in December 1983, while the natal Sun was under the special/multiple afflictions of Rahu, Ketu and Jupiter, the transit Sun was first under the malefic influence of natal Rahu-Ketu axis and next also under the simultaneous malefic influence of Rahu, Ketu and Jupiter in transit. Jupiter, one of the significators of health, was afflicted by Rahu-Ketu axis in transit. The Rahu-Ketu axis not only afflicted the natal Sun and the transit Sun and Jupiter but also all the houses occupied and aspected, including the ascendant. Saturn, the most malefic planet, was transiting close to the most effective point of the fourth house, also aspecting and afflicting the ascendant and the sixth house among all the houses occupied and aspected. The native had a severe attack of jaundice which took nearly four months for recovery. The severity on both these occasions was the result of the combined influences of all the malefic planets, Jupiter, Saturn, Rahu and Ketu. 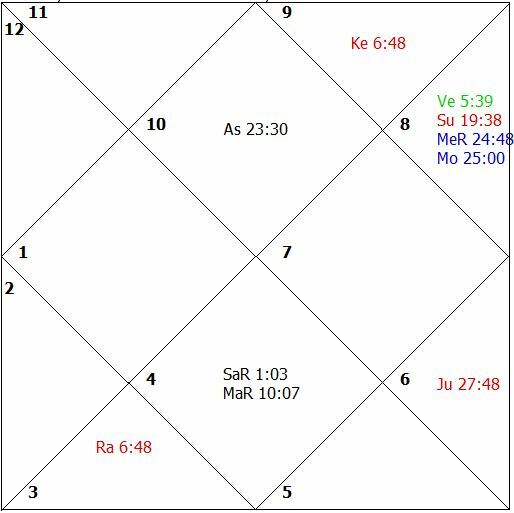 In March 1993, transit Rahu-Ketu axis afflicted simultaneously the natal Sun, lord of the second house, and the most effective point of the eleventh house, among all the houses occupied and aspected. 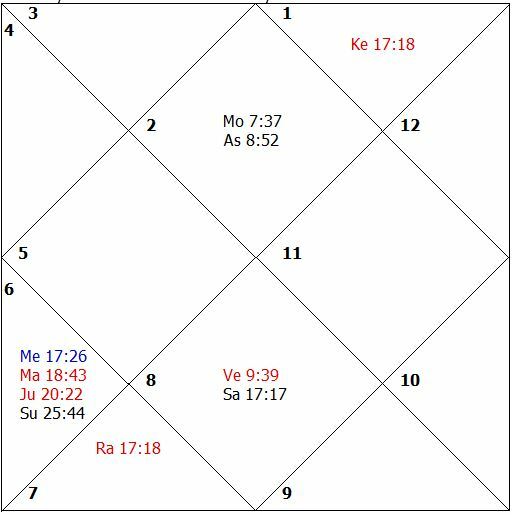 Transit Jupiter, in mutual aspect with Ketu, also afflicted the most effective point of the eleventh house. The native’s income from the business venture came to a halt due to closure of his works. This resulted in a financial loss in the form of idle capital employed. The Rahu-Ketu axis became stationary for about three months and the native suffered huge losses. Female born 15th October, 1969, 0145 Hrs. Delhi, India. The sign Cancer rises in the ascendant and Jupiter, Saturn, Rahu and Ketu become functional malefic planets for the native. The native was married in November, 1992, during the sub-period of Saturn, ruling the house of marital bond, in the main period of Mercury. The mooltrikona sign of Saturn falls in the eighth house. Though Saturn indicates marriage, its functional nature indicates inauspicious trend results. Saturn occupies its sign of debilitation. The lord of the tenth house, Mars, is in the sixth house. The lords of the ascendant, the Moon, and the fourth house, Venus, occupy their signs of debilitation. Venus is additionally weak due to its being in the state of infancy and the Sun is weak due to its being the state of old-age. Jupiter and the Sun form close conjunction with the most effective point of the third house. Jupiter is in the state of combustion and hence weak. But Jupiter afflicts both the Sun and the most effective point of the third house. Rahu-Ketu axis is close to the most effective points of the houses occupied and afflicts the houses occupied and aspected. The combustion and weakness of Jupiter, ruling the sixth house, indicates defeat to the native in the case of a dispute. 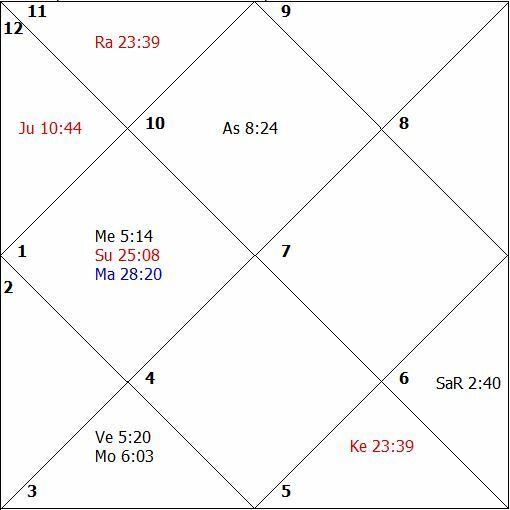 The chart shows roots for a disturbed domestic peace and emotional disturbance due to the weakness of the Moon and Venus and the close affliction to the Sun, the lord of the second house, by the lord of the sixth house. In the middle of October, 1992, the Sun formed close conjunction with its own natal position concurrent with Venus’s close conjunction with the most effective point of the fourth house which resulted in the fixation of marriage of the native. In the last week of October, 1992, itself, Ketu formed close conjunction with the most effective point of the eleventh house and close aspect to the natal Sun. Although the marriage was solemnized in early November, 1992, the seeds of disturbance in the family life were already sown with the aspect of transit Ketu to the Sun and the seventh house. The close conjunction of Ketu with the most effective point of the eleventh house ruling fulfillment of desires robbed the native of all happiness. The marriage broke off immediately after celebration in the third week of November, 1992, when transit Ketu formed exact aspect with the lord of the house of family. Both the natal and transit afflictions played their part. The turn of events shattered the native to the brink of madness. Advance astrological consultations would have warned the native against the marriage in November 1992. Transit Ketu’s aspect to the weak Jupiter, Venus and weak Moon and conjunction of debilitated Rahu with the weak Moon did not give any respite to the native during 1993. The tensions reduced when the transit afflictions separated. The marriage ended in divorce towards the end of 1993. The astrological help in this case could have been to advise delay in timing of the marriage, strengthening of the Sun, the Moon, Mars and Venus and propitiating Rahu, Ketu, Jupiter and Saturn. Female born 19th August, 1967, 2300 Hrs. Delhi, India. The sign Aries rises in the ascendant and Mercury, Rahu and Ketu become functional malefic planets. As Mercury is a fast moving planet, its transit afflictions are generally for short durations and hence have no significant value except making the person sensitive to circumstances. Both Mercury and Jupiter are weak due to combustion. Mercury is further weakened being in old age and debilitated in navamsa. The Moon is weak as it is in the state of old-age. The functional malefic planet Mercury closely afflicts Jupiter and the Moon besides closely afflicting the most effective points of the fourth and tenth houses. The main stress areas in the chart are health and domestic happiness. The close conjunction of Mercury with Jupiter and the most effective point of the fourth house causes the native to losses because of her aggressive nature. The most effective point of the ascendant is closely aspected by its lord, Mars. The weak Sun is closely aspected and afflicted by Rahu denying a stable mental peace. Venus is weak as it occupies its sign of debilitation in navamsa. The native was married in the sub-period of Jupiter in its own main period. The domestic peace or adjustment could not be established immediately as the marriage was followed by the operation of the sub-period of Saturn, placed in the twelfth house. The trends had been unfavorable in the sub-period of Saturn. As the lord of the seventh house occupies the fifth house along with the lord of the fifth house and Rahu-Ketu axis is quite away from the most effective points of the first and seventh houses, the native’s marital bond continued in spite of the occasional pins and pricks. The close conjunctions/aspects formed by transit Rahu-Ketu on natal Sun, Rahu, Mercury and Jupiter in the year 1992 and in early 1993 caused a lot of mental tensions to the native on account of inharmonious marital relations. The native performed astrological remedial measures as per the advice. CHART 7 Female born 3rd October, 1968, 0001 Hrs.60E05 22N35, India. The sign Gemini rises in the ascendant and Rahu and Ketu are the functional malefic planets. Rahu-Ketu axis forms an exact conjunction with the Sun in the natal chart. The Sun rules the house of initiatives and Rahu’s exact conjunction with this Sun makes the native a pleasure seeker. Mars occupies the house of initiatives along with the lord of the seventh house, Jupiter. The position of Mars in the third house is indicative of a courageous nature and the presence of Jupiter in the third house links the area of self-endeavor with the area of marital relationships. The placement of the lord of the fifth house, Venus, in the fifth house turns the native highly emotional and shows strong inclinations towards the traits of Venus. The lord of the house of family, the Moon, is weak as it is in the state of infancy. The dispositor of the Moon, Saturn, is also weak as it is in the state of old age. The lord of the fourth house joins the fifth house. 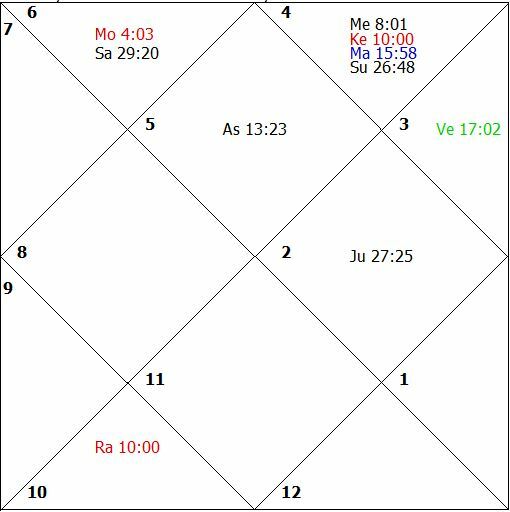 The chart has roots for a love marriage and unsuccessful romantic ventures because of the severe negative influences of Rahu on the Sun. During the main period of the lord of the seventh house and in its own sub-period the native entered into an emotional relationship. This relationship persisted for a period of over one year before culminating into a love marriage in September, 1992, during the sub-period of weak Saturn in the main period of Jupiter. The natal Moon, the lord of the house of family, was closely aspected by the transit Ketu in September, 1992, followed by a close aspect of Rahu to Saturn in October, 1992. 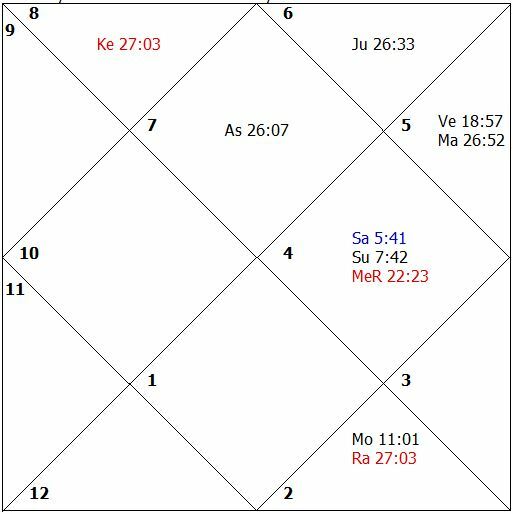 From November 1992 to August 1993, transit Jupiter, lord of the seventh house, was under the close malefic influence of the natal Rahu-Ketu axis in the fourth house. The husband of the native deserted her just within three months of the marriage, when the affliction of natal Rahu-Ketu axis to transit Jupiter became exact for the first time. Advance astrological consultations in such cases prevent mishaps. The remedies suggested are for strengthening of the weak functional benefic planets and propitiating the functional malefic planets. While the remedial measures after the unfortunate happenings try to help, the preventive remedial measures prove to be very helpful and have been successful in completely avoiding the irreparable loss. The exact/close conjunction of Rahu-Ketu axis with the Sun in female nativities gives ill-health to father and the native in addition to stealing happiness from father, marriage and the male progeny. Such a combination also affects the functioning of the heart badly giving diseases like hyper-tension quite early in life. CHART 8 Male born 23rd April, 1928, 1300 Hrs. Delhi, India. The sign Cancer rises in the ascendant and Jupiter, Saturn, Rahu and Ketu are the functional malefic planets. The most malefic planet Saturn forms close conjunction with the fifth house and afflicts the houses occupied and aspected. The functional malefic planet Jupiter closely afflicts Mercury and Saturn by conjunction and aspect respectively. Venus, the lord of the fourth house, is strong in the natal chart. The health is ruled by the Moon and Jupiter. The Moon is weak, as it is afflicted by Saturn and its moolatrikona house is afflicted by Jupiter. Jupiter is weak as it is in old-age in the rasi chart and is afflicting the house it resides in along with the ascendant, third and fifth houses. Mercury is weak, as it is debilitated in both rasi and navamsa besides being in old-age, combust and Mercury along with its moolatrikona sign house is afflicted by Jupiter. The health and the younger brother of the native had caused concerns to the native throughout his life. 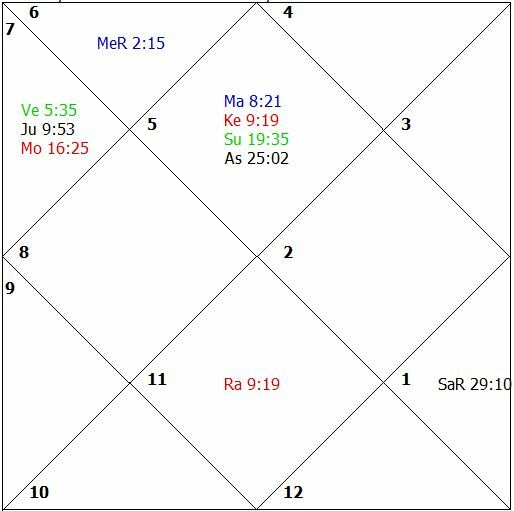 In the later part of October, 1992, while under the simultaneous malefic influence of natal Saturn and Jupiter, transit debilitated Rahu formed close aspect to natal Mercury and Jupiter and close conjunction to natal Saturn and the native suffered from a paralytic attack. He succumbed to the illness in the first week of November, 1992, when the transit Sun came under the exact aspect of transit Saturn. Rahu’s aspect was almost stationary, afflicting all the houses occupied and aspected. The native was running the sub-period of Venus in the main period of Mercury. 15th August, 1947, 0000 Hrs. New Delhi, India. Chart 9 has been included to show the benefits of Astrology to nations, business and society at large. The sign Taurus rises in the ascendant and Venus, Jupiter, Mars, Rahu and Ketu are the functional malefic planets. 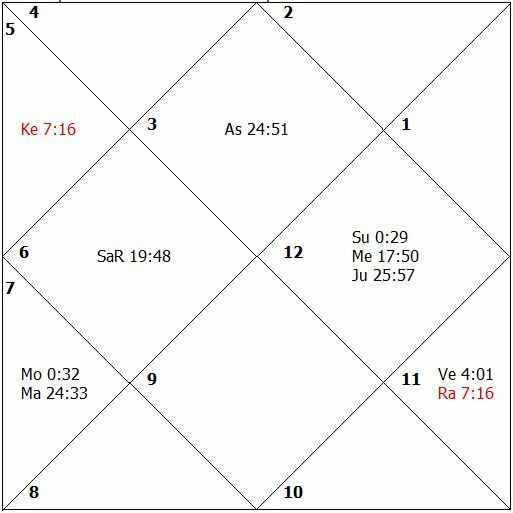 In the end of April, 1992, during the main and sub-periods of Venus, transit Ketu came close to the most effective point of the second house and to natal Mars. Transit Jupiter, the most malefic planet, was closely conjunct with the most effective point of the fourth house. Transit Saturn, lord of the tenth house, was under the close aspect of natal Venus. At that time, India suffered from the security scam of the stock market involving billions of rupees and various financial institutions. The second house in a mundane chart deals with finances, relations with neighbors and internal peace inter alia other things. The relations with Pakistan worsened due to encroachment of diplomatic rights of Indian High Commission personnel in Islamabad and torturing one of the senior diplomats. The communal tension also mounted from May, 1992, to August, 1992. The period appeared to be very long due to very slow movement of Rahu. Rahu was almost stationary in June and July, 1992, at 6 degree 57 minutes in Sagittarius. At another occasion, in November, 1992, when Rahu was having very slow motion, it formed single degree aspect with the natal Sun, ruling the fourth house of the Indian Independence chart. The Sun is weak due to its being in the state of old-age. In spite of bringing it to the notice of persons close to the country’s leadership by the author, hardly any regard was paid to the astrological advice. The fourth house of the mundane chart inter alia other things deals with internal peace and the Parliament. Due to the demolition of a disputed structure at Ayodhya not only the internal peace of the country was disturbed due to wide spread riots but the normal business also could not be transacted in the Parliament. As the Sun is significator for the head of the State, the Prime Minister being head of the Executive in India, was under extreme tension. In both of these spells business suffered a setback due to lack of full fledged support to business activity by the financial institutions primarily because of the security scam, which was direct result of transiting planetary influence. In the latter incident, business activity suffered a setback because of the totally disturbed law and order situation in December, 1992, and January, 1993. Not only the government but media as well, do not give due regard to the astrological indications. They do not want to encourage the astrological part of our cultural heritage. Business can exercise caution during periods indicated unfavorable for law and order and financial difficulty, while the government can tighten its machinery of maintaining law and order to avoid the loss of life and property of the masses. The loss of life and property suffered by the country in December, 1992, could have been averted had the law and order machinery acted in a pro-active manner in place of a reactive manner. Let us see another dimension of the transit influences. In January, 1993, in the beginning of the sub-period of the Sun from the main period of Venus, when the natal Sun was under the affliction of transit Rahu and transit Saturn under the affliction of transit Jupiter, transit Ketu and natal Venus, the transit Sun in the eighth house came under the exact affliction of transit Mars in the second house. At that time, there were many incidents of fire and blasts, like the blast in Kashi Vishwanath train, a fire in a book fair in Madras, the firing in Sopore (J&K), an airplane catching fire and burning of properties in Bombay. 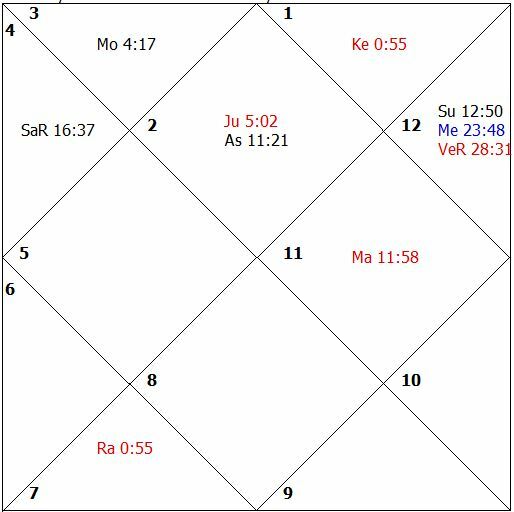 In the Indian Independence chart, Mars rules the house of losses and signifies fire and blasts whereas the Sun, placed in the third house signifies communications. The books, trains and aero planes are prominent means of communications. Male born 1st March, 1950, 0955 Hours. Pune, India. The sign Aries rises in the ascendant and Mercury, Rahu and Ketu become functional malefic planets. The results generated depend upon transit conjunctions/aspects with reference to the significations ruled by the planets involved, their mooltrikona sign houses and their houses of placement. This is true for all possible combinations of transit influence, i.e., transit over natal, transit over transit, and natal over transit. In this case Jupiter, ruling the ninth house, is placed in the tenth house and is very weak due to its being in the state of debilitation and old-age and exactly afflicted by Mercury. Rahu and Ketu, placed in malefic houses, afflict all the houses occupied and aspected. The native was running the sub-period of Venus in its own main period. Venus is placed very near to the most effective point of the tenth house, but it is closely aspected by the most malefic planet, Ketu, from the sixth house. Venus rules pleasures and affluence. The native was connected with one of the professions ruled by Venus, and was enjoying a very senior management position. The trends were good. But as soon as the transit Ketu’s aspect started closing in on the natal conjunction of Jupiter and Mercury and the transit Saturn came under the close aspect of natal Ketu, in September, 1992, the native suddenly lost his employment. 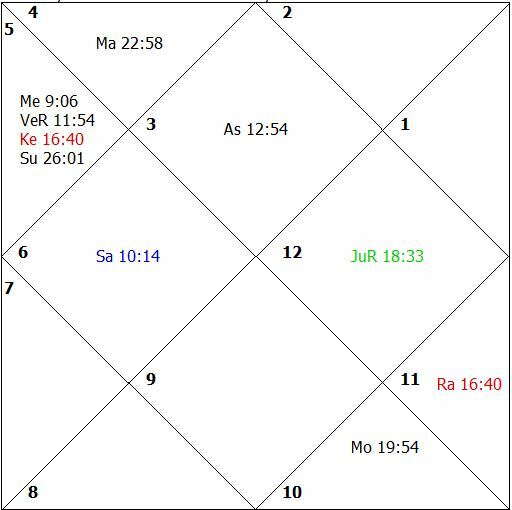 In October, 1992, he lost his second employment as the previous malefic influences became stronger and transit Jupiter became closely conjunct with natal Ketu. The native then sought astrological help. He was suggested propitiatory remedial measures for Ketu, Rahu and Mercury and strengthening of Mars and Jupiter with the help of a Kavach for overcoming his problems and obtaining a stable, good and prosperous further employment. The native was re-employed towards the end of November, 1992, even though the malefic aspect of transit Ketu on the natal conjunction of Jupiter and Mercury had become exact and transit Jupiter has become exactly conjunct natal Ketu. Because of the performance of the remedial measures, the native is enjoying a protective cover against further unfavorable transit conjunctions/aspects influences. Male born 15th December, 1927, at 2100 Hours. 73E21, 30N58 Time Zone 0530 Hrs. India. The sign Cancer rises in the ascendant and Jupiter, Saturn, Rahu and Ketu are the functional malefic planets. The most malefic planet Saturn is in the state of combustion. The Sun is in the state of old-age and under the close affliction of the Rahu-Ketu axis. The affliction of the Sun caused the problem of high blood pressure at a very early stage of life. The native had sub-period of Mercury in the main period of Saturn from March, 1989, to November, 1991 and this was followed by the sub-period of Ketu up through the year 1992. The affliction of Rahu-Ketu axis to the Sun is a sure indicator of improper functioning of the heart, blood circulation and trouble on account of male progeny. During the sub-period of Ketu, the disease of blood pressure became quite acute. The weak and afflicted Sun was transited over by debilitated Rahu in November, 1992. 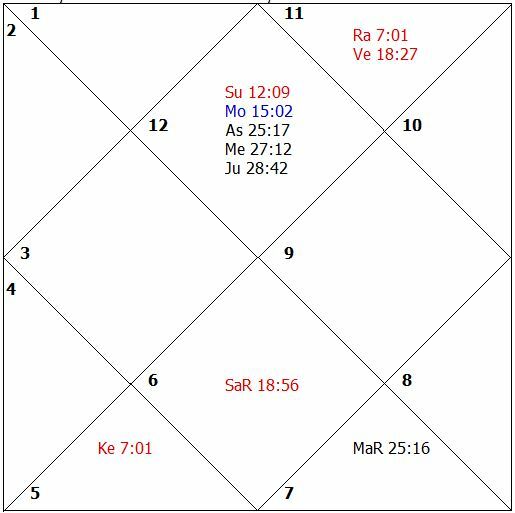 As the Sun rules the second house in this chart and is placed in the fifth house, the native suffered from bleeding in the mouth, increased problem of hyper-tension and lack of attention from his male progeny. 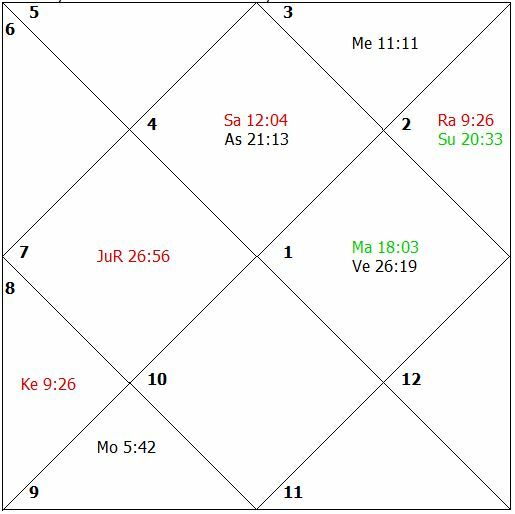 During the sub-period of Ketu because of its close conjunction to the Sun in the natal chart, the trends were unfavorable. The native was suggested propitiatory remedies for Rahu, Ketu, Jupiter and Saturn and the Yantra (Kavach) for strengthening the weak functional benefic planets. Female born 3rd November, 1962, at 0825 Hours. Delhi, India. The sign Scorpio rises in the ascendant and Mars, Venus, Rahu and Ketu are the functional malefic planets. As Mars and Venus are fast moving planets, disturbance caused by their transit conjunctions/aspects to natal planetary positions are short-lived. However, this gives frequent problems. When we analyze the influence of transit malefics over transit positions and natal positions, usually the longer impacts are created by Rahu and Ketu. But we should not forget that when we analyze the influence of natal malefics over transit positions the duration of the impact depends only on the speed of the planet(s) in transit. The native was running the sub-period of Mercury in the main period of Mars from December, 1991, through November, 1992, and in this period the native had increased income and was enjoying satisfaction when suddenly the exact conjunction of transit Rahu with the most effective point of the second house in April, 1992, involved the job of the native in complications created by the security scam of 1992. While the transit Rahu was exactly aspecting the sixth, eighth and tenth houses, the transit Ketu was exactly aspecting the most effective points of the twelfth, second and fourth houses. 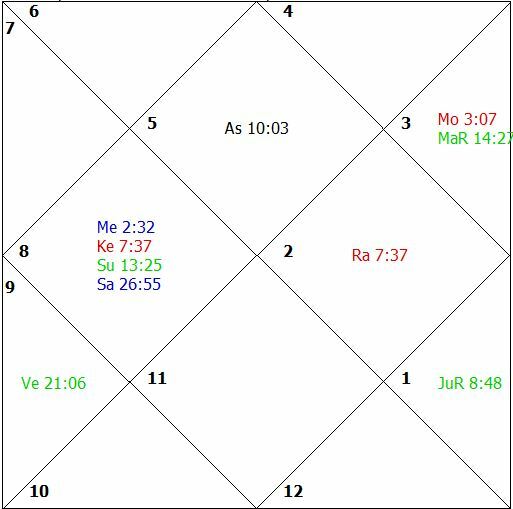 Transit Ketu was forming an exact aspect and afflicting natal Jupiter in the fourth house, while transit Jupiter was afflicted by transit Mars. The mental peace of the native was fully disturbed as the lord of the fourth house, being already closely afflicted by Rahu-Ketu axis in the natal chart, was also in transit under the affliction of natal Mars. Transit Mars, lord of the sixth, was also afflicted by natal Mars. The seeds of trouble were sown at the time of transit aspect of Ketu to the debilitated and afflicted Sun, lord of the tenth house in January, 1992. The native was performing astral-remedies in advance based on the forewarning and could pass the time of stress and strain and finally coming out clear and saving her job, though the native had sleepless nights because of the tension. Male born 24th July, 1946, 1341 Hours. Nasirabad, India. The sign Libra rises in the ascendant and Mercury, Rahu and Ketu become functional malefic planets. The main points of the chart are the placement of the lord of the house of initiatives, Jupiter, in the house of losses, the combustion of Saturn and the placement of the lord of the tenth house in the eighth house. Rahu-Ketu axis is close to the most effective points of the houses occupied and afflicts the houses occupied and aspected. Ketu closely afflicts the weak Mercury while Rahu closely afflicts the weak Jupiter. Mercury closely afflicts the tenth and fourth houses. The lord of the tenth house is weak and badly placed in the eighth house. From 29th August, 1988, the native was running the sub-period of Venus in the main period of Jupiter. Venus is the lord of the ascendant and posited in the eleventh house. The trends were favorable and the native did not pay any attention to the astrological advice, which in his opinion was in contravention to his general assessment and the circumstances. In December, 1990, when transit Ketu formed exact conjunction with the natal Saturn and close conjunction with the natal Sun, transit Jupiter was afflicted by natal Mercury, and transit Sun was under the close affliction of natal Ketu, the native just scribbled his resignation from the job in a heated exchange of arguments with his boss. As Saturn suffering the current affliction was placed in the tenth house, his informal and scribbled request of resignation was accepted by his employer to his utter surprise. To withdraw his resignation, the native had to forgo his claims amounting to more than fifty thousand rupees. In March, 1992, the native was running the sub-period of the Moon in the main period of Jupiter, transit Mars and transit Saturn were under the affliction of natal Mercury, and transit Venus was under the affliction of natal Mercury and natal Rahu. 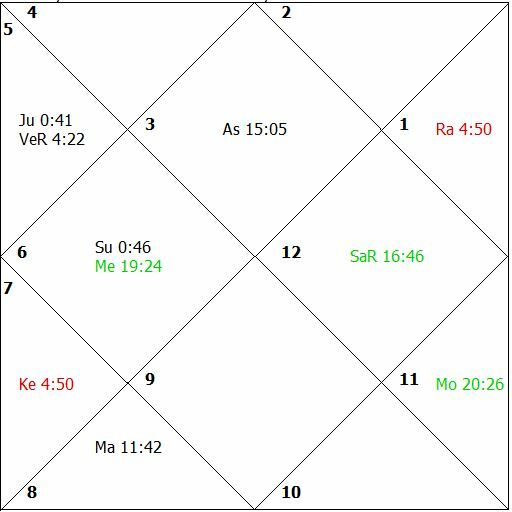 When transit Rahu in the third house formed a close aspect with transit Jupiter, the native left his job and went to a foreign country with the sole intention of expected major financial gains. Male born November, 1930, 1500 Hrs. Guwahati, India. Birth particulars and full planetary positions have been withheld in this case and a few others for fear of identification of the public figures. But the inclusion of such case studies has been considered necessary. The sign Pisces rises in the ascendant and the Sun, Venus, Saturn, Rahu and Ketu become functional malefic planets. The Rahu-Ketu axis is close to the most effective points of the first and seventh houses and afflicts these houses besides afflicting the most effective point of the third, fifth, ninth and eleventh houses. The functional malefic planets, the Sun and Venus, are exactly conjunct with each other and indicate severe litigation problems. 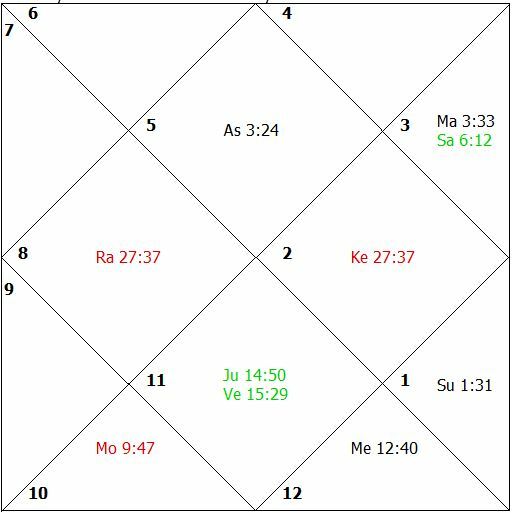 In May 1992, transit Saturn in the eleventh house formed a close aspect to the most effective point of the ascendant, fifth and eighth houses, and transit Jupiter in the sixth house was afflicted by transit Rahu. This resulted in the involvement of the native in a criminal case. As a subsequent successive transit aspect of debilitated Rahu to natal Rahu and the natal ascendant slowed the process of coming out of the involvement. The astrological help was sought which was given in the form of suggestions for propitiating Saturn, Rahu, Ketu, Sun and Venus and strengthening of weak Jupiter with a Kavach. He was advised to wait for the opportune time expected after March, 1993. He was running the sub-period of Jupiter in the main period of Jupiter. Jupiter rules the tenth house in the natal chart and exactly aspects the same in the natal chart. At the time of his involvement in the criminal case, Jupiter was transiting in the sixth house and hence was incapable of protecting his significations being threatened by other malefic transits. Male born 27th August, 1949, 0150 Hrs. Anandpur, India. The sign Gemini rises in the ascendant and Rahu and Ketu are the functional malefic planets. Saturn is combust in the chart. Jupiter is debilitated, is in the state of infancy and placed in the eighth house, hence it is extremely weak. 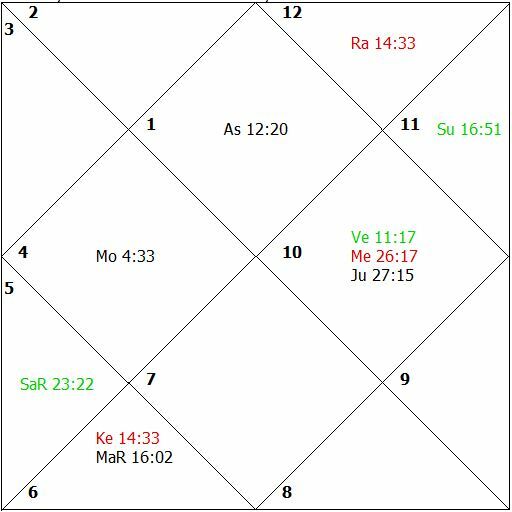 During November, 1991, transit Rahu formed a close conjunction with the most effective point of the seventh house, as well as a close aspect to the weak Saturn. Rahu’s speed was quite slow. The native started feeling tension in connection with his financial assets and approached us for astrological help. The propitiatory astrological remedial measures were suggested for Rahu and Ketu. 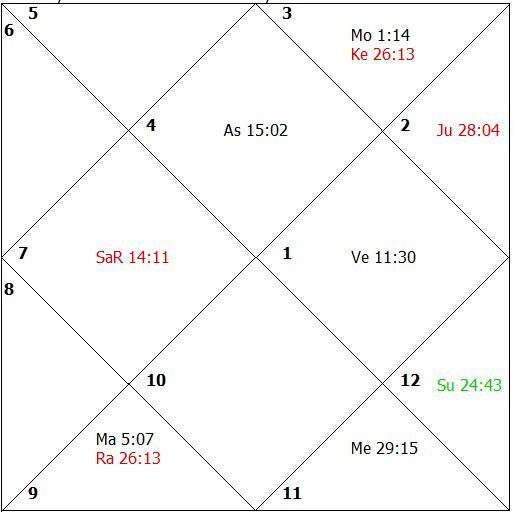 In January, 1992, transit Rahu formed a close aspect to the natal Saturn. The native was interrogated by the state investigating agency. His passport was impounded. But due to the pre-astrological advice and performance of astrological remedial measures as soon as Rahu’s close aspect separated not only the native was cleared by the investigating agencies but his passport was also released as per the prediction. This native sought astrological advice in the last week of September, 1992, which was given in writing along with a copy of the author’s published article on “Identifying Significant Events” as the native had been a student of Astrology. The propitiatory astrological remedial measures were suggested for Rahu and Ketu, whose axis was due to form a close conjunction with the weak lord of the fifth house, Mercury, placed in the seventh house, as well as closing in to afflict simultaneously also the most effective points of first, third, fifth, seventh, ninth and eleventh houses. 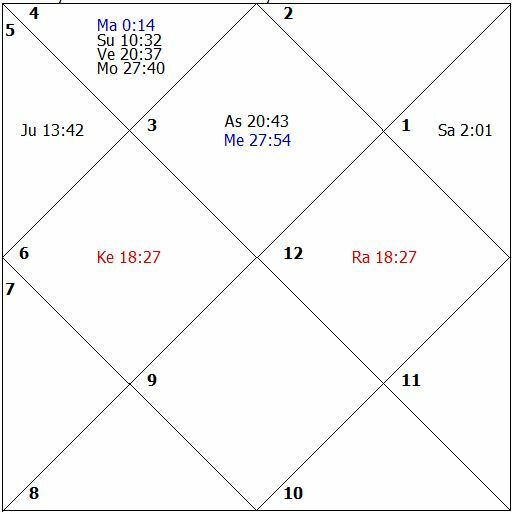 In October, 1992 transit Rahu and Ketu then went into their signs of debilitation. Transit Rahu came into a single degree conjunction with Mercury with effect from 12th October, 1992. 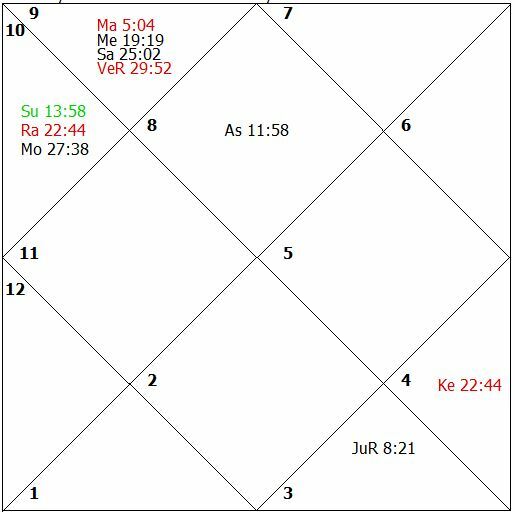 Rahu’s movement was very slow and in the months of November and December, 1992, it was almost stationary. The native was picked up by the investigating agencies in December, 1992. The native did not perform the appropriate remedial measures which were suggested to him as immediately after the advice he was involved in the evil designs of the debilitated transit of Rahu and Ketu. As the movement of Rahu was almost stationary his release by investigating agencies was delayed on one pretext or the other up to the middle of January, 1993. Female born 4th June, 1948, 1215 Hrs. 76E14 10N32, India. The sign Leo rises in the ascendant and the Moon, Rahu and Ketu are the functional malefic planets. The yogakaraka planet, Mars, occupies the ascendant and is near the most effective point of the ascendant. The lord of the ascendant, the Sun, occupies the tenth house. The native is an officer with the government. Jupiter is weak as it is placed in the state of infancy though occupying its own mooltrikona sign in the fifth house. During the main period of Mars the native had been enjoying an authoritative appointment when suddenly during the sub-period of Venus an infection was reported in the uterus. The symptomatic treatment could not help. 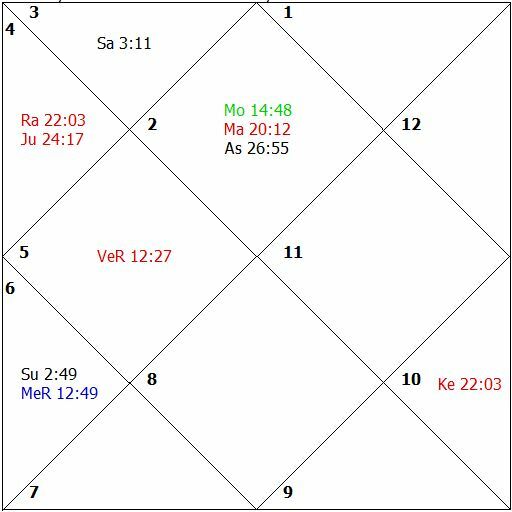 The transit Rahu had formed a close conjunction with natal weak Jupiter in September 1992. Under this malefic transit influence, the native had to undergo a surgical operation for removal of her uterus in the sub-period of the Moon, who is the lord of the twelfth house. Male born 8th April, 1954, 1320 Hrs. Gurgaon, India. The sign Cancer rises in the ascendant and Jupiter, Saturn, Rahu and Ketu are the functional malefic planets. The most malefic planet, Saturn, is closely conjunct with the most effective point of the fourth house and also forms close aspects to the most effective points of the sixth, tenth and first houses. Mercury is badly placed in the 8th house and is afflicted by Ketu from the twelfth house in the natal chart. In the second half of 1992, the Rahu-Ketu axis was to form a close conjunction with the natal Moon and Jupiter. Both of these planets are weak in the natal chart. The Moon rules the ascendant while the mooltrikona sign of Jupiter is in the sixth house. Both the Moon and Jupiter signify health in this case. The forming of a conjunction of transit Ketu started with the natal Moon in the twelfth house in the second week of September, 1992. As the Moon rules the ascendant and, being very weak in the state of infancy and afflicted by Jupiter (the natural significator of feet), is placed in the twelfth house (also ruling feet) and Ketu signify violent injuries, the native was restrained from using his feet because of a fracture of the lower portion of his legs. 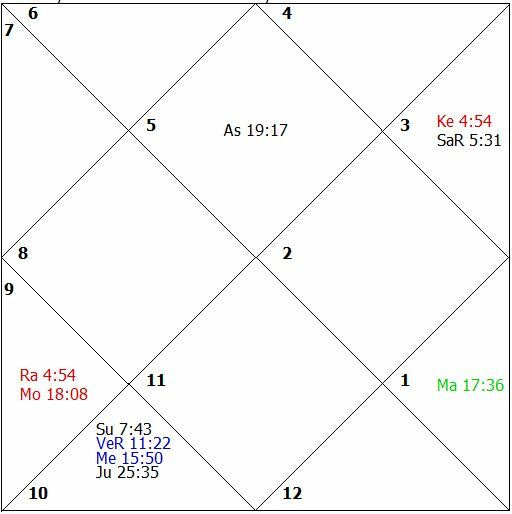 The trend was unfavorable as Saturn having its mooltrikona sign in the eighth house, was having its sub-period in its own main period. The native is a medical practitioner. The loss of his medical practice resulted in loss of income and loss of fortune. The loss of income, additional heavy medical expenditure and the uncertainty about his future physical fitness caused tremendous stress to the native. Male born 21st January, 1974, 2102 Hrs. Delhi, India. The sign Leo rises in the ascendant and the Moon, Rahu and Ketu are the functional malefic planets. 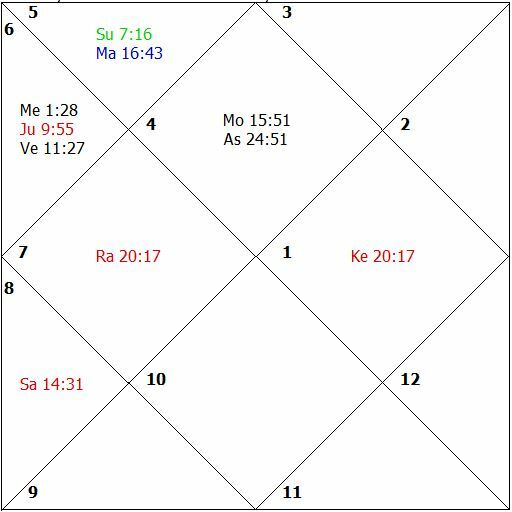 Saturn is exactly conjunct with Ketu, being simultaneously afflicted by Rahu and Ketu and hence is very weak. The functional malefic planet, Moon, closely afflicts the most effective points of the fifth and eleventh houses. The lords of the ascendant, second, third and fifth houses have been rendered weak as they are placed in the sixth house. Jupiter is additionally weak as it is in the state of old-age and it is placed in its sign of debilitation, as well. Venus and Mercury are combust. 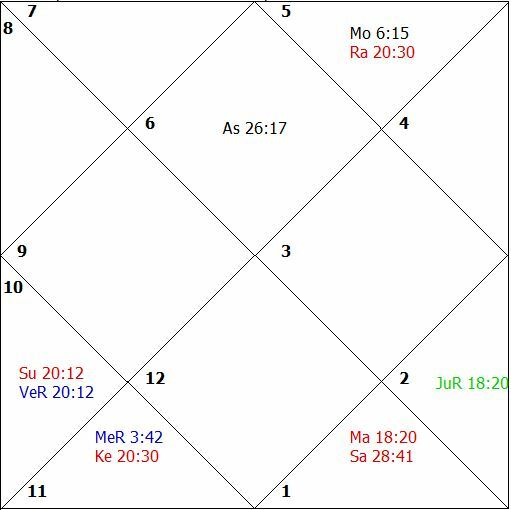 Rahu and Ketu’s exact transit over their natal positions in August, 1992, involved the native in aimless associations and highly activated him in fields other than his studies. Rahu took full control of his wisdom as the lord of the fifth house is weak and the fifth house is closely afflicted by the functional malefic planet, Moon. Rahu turned him into a pleasure seeker putting his professional studies aside. 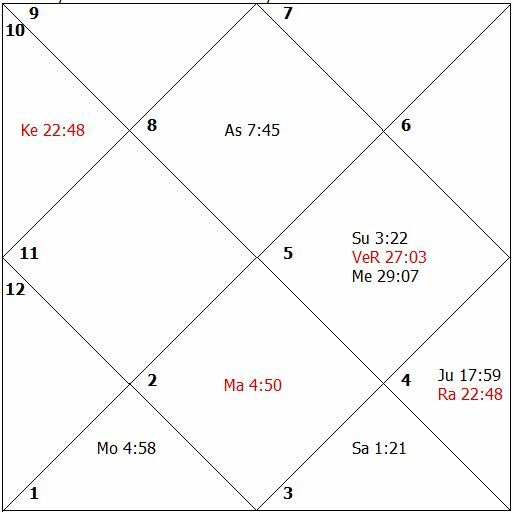 The transit conjunction of Rahu over its natal position in August, 1992, was followed by closing aspect of transit Ketu to the debilitated lord of the fifth house, in October, 1992. The native was involved in a road accident and had a fracture. This coincided with the onset of the main period of the lord of the twelfth house, the Moon. Due to his earlier ill-health in the sub-period of combust Venus placed in the sixth house along with the lord of the ascendant in the latter’s main period, the native had to discontinue his engineering studies. Thereafter, the native started pursuing the career of accountancy which, also experienced, obstructed progress. Due to the weakness and affliction of all the planets, except Mars, the native is mostly dependent upon his father. Female born 20th August, 1943, 1314 Hrs. 70E56 31N50, India. The sign Scorpio rises in the ascendant and Mars, Venus, Rahu and Ketu are the functional malefic planets. The planets, the Sun, Saturn and Mars are weak as they are placed in the state of infancy. Mercury and Venus are weak as they are placed in the state of old-age. Saturn is additionally weak on account of its placement in the eighth house. The Moon is weak as it is placed in the sixth house and its dispositor is weak. Jupiter is weak and afflicted as its dispositor, the Moon, is weak and Jupiter is under the affliction of the Rahu-Ketu axis. Mercury is closely conjunct with the functional malefic planet, Venus, and hence afflicted. The main period of the Sun, ruling the tenth house and placed in the tenth house, blessed the native with job, marriage and the birth of a son. But as most of the planets are weak, the native kept on getting unfavorable, serious and minor jerks. Mars forms a close conjunction with the most effective point of the seventh house and produces Manglik yoga. Mars closely afflicts the Sun and the most effective points of the houses occupied and aspected. The fast moving planets, Mars and Venus, although having short-lived transit influences they have more frequent contacts by close conjunctions/aspects with the weak natal planets. The main period of the Sun was followed by the main period of the Moon. The Moon is placed in the sixth house. The next main period was that of Mars, the lord of the sixth house which is causing a close affliction in the chart. During the main period of Mars and the sub-period of the Sun the husband of the native died in a hernia operation and from infection. 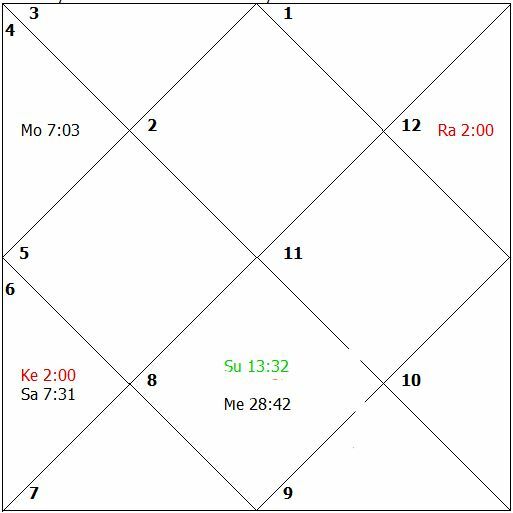 At the time of the death of the husband in April, 1990, Ketu was forming close conjunction with the weak and afflicted Jupiter, signifying the husband and having the mooltrikona sign in the second house, which rules family. While the operating sub-periods of planets or transit afflictions to them mainly touch their general significations and the significations of the houses where the mooltrikona signs of such planets fall, the non-mooltrikona sign houses suffer if the most effective point of the house involved is afflicted. Female born 27th March, 1977, 0927 Hrs. Gurgaon, India. The sign Taurus rises in the ascendant and Venus, Jupiter, Mars, Rahu and Ketu are the functional malefic planets. All the functional benefic planets are weak in the chart. Mercury is weak as it is placed in its sign of debilitation and it suffers from combustion. The Moon is weak as it is placed in the state of infancy and it is closely afflicted by the aspect of Rahu from the sixth house. The functional malefic planet, Mars, forms exact conjunction with the most effective point of the tenth house and afflicts all the houses, occupied and aspected. The astrological help was sought on the 31st October, 1992, when the native had lost vision and was advised to have an operation by eye specialists of the All India Institute of Medical Sciences, Delhi, at the earliest. The close malefic influence of transit Jupiter, the most malefic planet, to the most effective point of the twelfth house and its lord, Mars, in May, 1992, started giving headaches to the child. The health problem was further aggravated when Ketu formed a close conjunction with the Moon in the second house at the end of August, 1992, and Rahu exactly aspected the natal Ketu in the twelfth house in early October, 1992. These unfavorable transit aspects were immediately followed by debilitated Rahu’s aspect to the significator of vision, Venus, ruling the sixth house in the natal chart. Venus is weak as it is placed in the state of old-age. 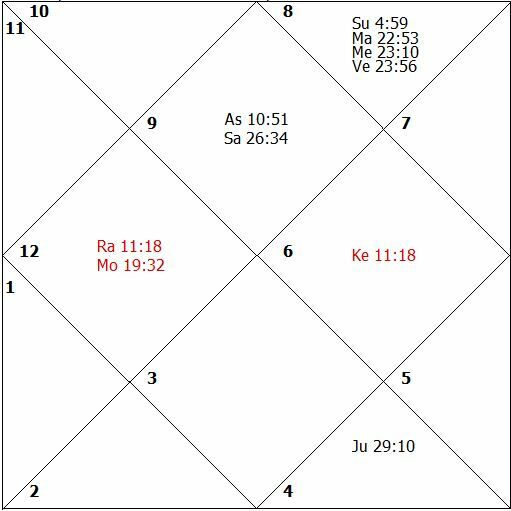 The separation of the exact aspect of Rahu to Venus was delayed as Rahu became almost stationary up to December, 1992. 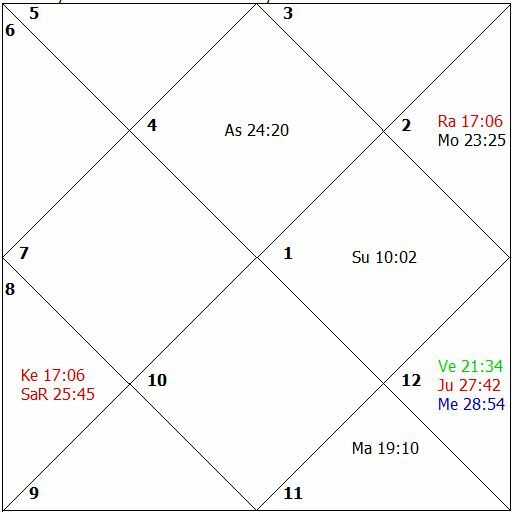 The child reported loss of vision on 27th October, 1992, when natal Venus was experiencing an exact aspect influence from transit Rahu in debilitation. The parents of the child, who had been blessed with a male child after performance of the remedial measures under the guidance of the author, are great believers in the divine science. They sought astrological help which was given to them in the form of a yantra (Kavach) for the weak functional benefic planets and propitiatory astrological remedial measures were advised for Rahu, Ketu, Mars, Venus and Jupiter. With the performance of the propitiatory astrological remedial measures not only did the doctors attending the child withdraw their advice of an operation but the child almost fully responded to the symptomatic treatment by the end of December, 1992. Male born 16th May, 1966, 0650 Hrs. Jullundur, India. The sign Taurus rises in the ascendant and Venus, Jupiter, Mars, Rahu and Ketu are the functional malefic planets. This chart was brought up in May, 1990, for indication of marriage. The native was running the sub-period of Saturn in the main period of Mercury. Saturn is the only slow moving benefic planet in this chart. For major events in life the transit influences of slow moving planets are seen. In May, 1990, Saturn was at 1 degree in Capricorn. Its contact with the seventh house or significator needed to be considered. The earliest that Saturn was forming an exact aspect to natal Venus, the significator for wife, was in the last week of February, 1992. The speed of Saturn was comparatively very fast and it was thought that while it may start the ball rolling an engagement might be possible when transit Saturn formed an exact aspect with exalted Venus in September or October, 1992, when its speed would be slower than the average. For timing good events, the fast speed of slow moving planets is not desirable. During September, 1992, the marriage proposal mooted in February, 1992, was finalized and an engagement was solemnized in early October, 1992. For ensuring auspicious events, the slow moving functional benefic planets, if weak, should be strengthened through a Kavach or a Special Power Kavach, as per the requirement. Male born 14th March, 1952, 1320 Hrs. Delhi, India. The sign Gemini rises in the ascendant and Rahu and Ketu are the functional malefic planets. Mercury, ruling the house of assets, is weak as it is in its sign of debilitation. Both the Sun and the Moon are in the state of infancy, hence weak. Saturn is weak due to the weakness of its dispositor. Venus, ruling the fifth house, is highly afflicted by the close conjunction of Rahu and close aspect of Ketu. The planets, Saturn and Mercury though weak, generate a benefic confluence due to their mutual close aspect. Jupiter gives rise to Hamsa yoga and is very near the most effective point of the tenth house. The trends in the chart are weak for the second, fourth, ninth, third and fifth houses. But because of the two planetary confluences mentioned in the preceding paragraph, the native has been able to lead an above average life. When a number of planets are weak and afflicted, as in this case, the transit malefic planets keep on creating some problem or other, which causes worries on account of health of children, acquiring assets and his financial position, which had been tight. Hamsa yoga in the tenth house has blessed the native with the knowledge of divine science of Astrology and has kept him away from vices. The close aspect formed by debilitated transit Rahu from the sixth house with natal Jupiter during November, 1992, gave rise to further debts. The stationary position of transit Rahu, which came close to the most effective points of various houses, cleared the native from the financial crisis only after the end of February, 1993. The native performed the advised propitiatory astrological remedial measures. Female born 20th April, 1992, 1542 Hrs. New York, USA. The sign Leo rises in the ascendant and the Moon, Rahu and Ketu are the functional malefic planets. The lord of the ascendant and Jupiter are afflicted by the close aspect of Rahu. Saturn, the ayushkaraka – significator of longevity, is placed in the sixth house and is weak. Mercury in its sign of debilitation is placed in the eighth house and is rendered weak. Exalted Venus is also badly placed and rendered weak. The Moon occupies its sign of debilitation in the fourth house near the most effective point; afflicts the same and is weak. The weakness of Saturn rendered Mars weak which made the Sun weak. At the time of the birth, the child was running the sub-period of afflicted Sun in the main period of badly placed debilitated Mercury. The affliction to the lord of ascendant and other weak planets resulted in the abnormal health of the child. The child was not in a position to move his hands and feet in spite of the best medical attendance available in USA. The astrological help was sought from India. Before this help could reach the child's parents, transit Rahu’s exact aspect to the weak and afflicted lord of the ascendant took the toll of the life of the child. 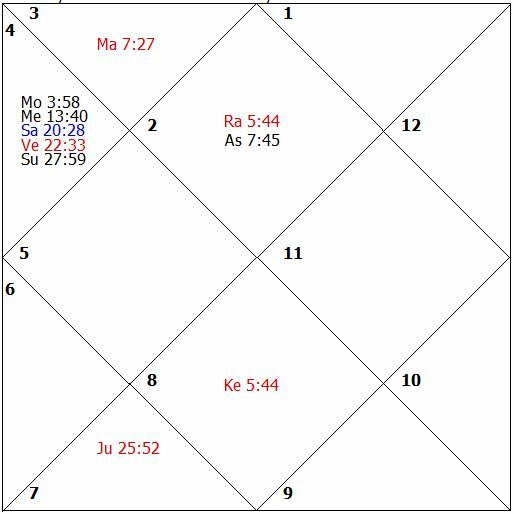 Rahu was again stationary in June, 1992, while Mars, the dispositor of the Sun, was transiting the eighth house. Male born 5th December, 1945, 1119 Hrs. Gurgaon, India. The sign Capricorn rises in the ascendant and the Sun, Jupiter, Rahu and Ketu become functional malefic planets. The functional malefic planets, the Sun and Jupiter, are close to the most effective point of the houses they occupy and afflict all the houses occupied and aspected. Due to the affliction of the functional malefic planet Jupiter to the ninth house, the father of the native could neither prosper nor keep good health. The Moon and Mars are weak as they are placed in their signs of debilitation and the Moon is also combust. The lord of the second house, Saturn, is weak as it is placed in the state of infancy and its dispositor is weak. The lord of the tenth house, Venus, is placed in the house of gains in the chart. Venus, the significator for wife, blessed the native with marriage without delay in spite of the weakness of the lords of the seventh, second and fourth houses. Mercury is combust and placed in a house afflicted by the most malefic planet. The lord of the seventh house is closely conjunct with the lord of the ninth house, and both are closely conjunct the most effective point of the house occupied. When transit Ketu formed close aspect with natal Jupiter during the end of October, 1992, the native’s father had an aggravated illness, and the native had reduced income and suffered from an unwanted movement in his work area. Under the transit Rahu’s close conjunction to the natal Moon and Mercury and Ketu’s close conjunction to the most effective point of the fifth house during the end of January, 1993 and in February, 1993, the native again had serious concerns for the health of his father, wife, income and health and education of children. The transit Saturn’s close aspect to the natal tenth lord in April, 1993, blessed the native with a promotion. Male born 2nd February, 1942, 2312 Hrs. 74E38 40N55, India. The sign Virgo rises in the ascendant and Saturn, Mars, the Sun, Rahu and Ketu are the functional malefic planets. The lord of the fourth house, Jupiter, occupies the ninth house linking the assets and happiness with fortune and father. The occupation of the eighth house by its lord, Mars, indicates good inheritance and long life. The placement of debilitated Saturn is quite away from Mars but is near to the most effective point of the eighth house. The strong placement of Mars in its own mooltrikona sign nullified the affliction of Saturn to the eighth house to some extent. However, the affliction of Saturn did create litigation but not with respect to the inheritance. The lord of the second house, Venus, is exactly conjunct with the functional malefic planet, the Sun, and is combust. The mutual aspect of Mercury and the Moon in the sixth and twelfth houses, respectively, despite weakness create a combination for earning of wealth through foreign lands. However, this does not auger well for the nervous health of the native. The strong Jupiter acts as an anchor-sheet in this nativity. When transit Jupiter aspected natal Venus in the beginning of January, 1991, and transit Venus formed a conjunction with the most effective point of the fifth house on 21st January, 1991, the native was blessed with a promotion. The close aspect of transit Jupiter to natal Venus during the end of June, 1991, made the promotion permanent. The concurrent conjunction of Rahu with the most effective point of the fourth house resulted in the loss of a valuable movable asset. Male born 13th August, 1953, 0705 Hrs. Vijayawada, India. The sign Leo rises in the ascendant and the Moon, Rahu and Ketu are the functional malefic planets. One of the specialties of the Leo ascendant natives is that they acquire high positions with governmental organizations in spite of weak natal planetary positions. In this chart, the strong Venus acts as an anchor-sheet for the native. Venus as the lord of the house of initiatives and courage by its position in the eleventh house indicates fulfillment of desires through self-efforts. 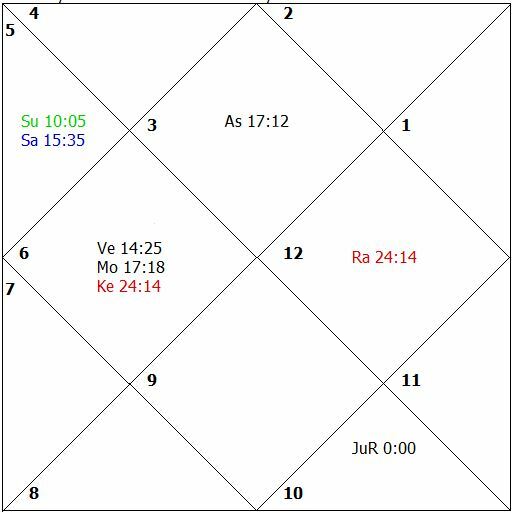 Apart from the position of Jupiter, the lord of the fifth house in the tenth house and Venus in the eleventh house, the rest of the planets are ill placed causing weakness. The Rahu-Ketu axis severely afflicts Mercury in the twelfth house. Mars is combust, debilitated and placed in the twelfth house. The native lost his father early in life and had difficult conditions in life during the main period of Mars running from his twelfth to nineteenth years of life. The Moon, ruling the twelfth house, is placed in the second house whereas Mercury ruling the second house is placed in the twelfth house. This indicates loss of position in life. There appears to be a definite chance of this indication as the native works more for earning goodwill of his superiors instead of working for the honest discharge of his duties. Coming back to our subject of the significant events, the native got a promotion when the transit functional benefic planets, Jupiter, Mars and Venus formed a close conjunction with natal Mars in June, 1991. The native was running the sub-period of Jupiter in its own main period. The trends were also favorable. Male born September, 1943, 2355 Hrs. 74E56 31N35, India. The sign Taurus rises in the ascendant and Venus, Jupiter, Mars, Rahu and Ketu are the functional malefic planets. The Rahu-Ketu axis and the functional malefic planet, Jupiter, are close to the most effective points of the houses occupied and afflict the houses occupied and aspected. Jupiter, itself, is also closely afflicted by the Rahu-Ketu axis. The functional benefic planet, the Moon, is exalted and placed in the ascendant. Mercury is exalted and placed in the fifth house. The lord of the tenth house, Saturn, is well-placed in the second house which rules status. The Sun is weak but well-placed and unafflicted. Other functional malefic planets, Mars and Venus, do not form close conjunctions in the chart. The life of the native had been quite eventful and I will take up few significant events here for discussion. 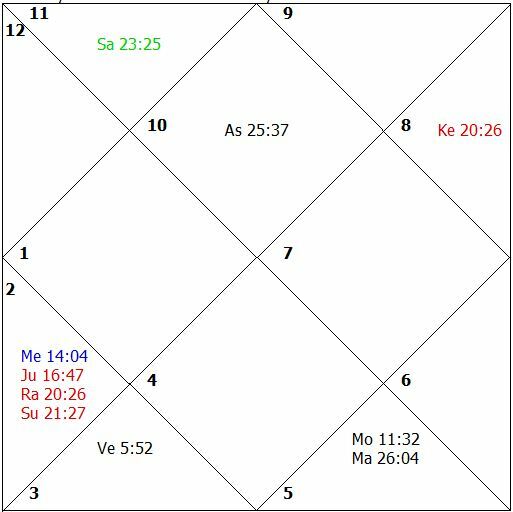 When transit Saturn formed a close conjunction with the most effective point of the ninth house in December, 1963, the native was selected for training as a Commissioned Officer in the Indian Army. In July, 1970, when transit Saturn formed a close aspect with the most effective point of the second house, ruling status, and the Sun was also forming conjunction, the native joined the Indian Foreign Service as a diplomat. In February, 1981, when the functional benefics, the Sun and Mercury, in transit were forming a conjunction in the tenth house, the native got a promotion. Again in May, 1984, when transit Saturn was forming an aspect with transit Sun, both of them being their signs of exaltations, the native got a promotion. In June-July, 1991, when the Rahu-Ketu axis transited the most effective points of the eighth and second houses, respectively, the native had a serious dispute with a nasty character. The charts, with fast moving functional benefics and with good natal combinations, generally, have many happy significant events in life. Male born 24th August, 1957, 0400 Hrs. 93E50, 23N55, India. The sign Cancer rises in the ascendant and Jupiter, Saturn, Rahu and Ketu are the functional malefic planets. The lord of the second house, the Sun, is placed in the second house, itself. The yogakaraka planet, Mars, is placed in the second house. Mars is weak as it is in the state of combustion. Though exalted, Mercury is weak as it is placed in the state of infancy. The functional malefic planet, Jupiter, closely afflicts debilitated Venus. The lord of the ascendant, the Moon, is weak as it is placed in its sign of debilitation in navamsa. Due to the weakness of functional benefic planets, including the lord of the tenth house, and the close afflictions, the native could not attain high status in life in spite of the sign Cancer rising and the Sun being placed in the second house. The major stress areas are health problems and more on the mental level. The weakness of Venus has caused sufferings by way of delayed marriage and loss of assets. Venus is significator for wife and its mooltrikona sign falls in the fourth house, ruling assets. When transit Rahu-Ketu caused a conjunction with the most effective point of the sixth and twelfth houses and Rahu closely aspected and afflicted the most effective point of the second house in June, 1991, the native suffered a substantial loss in speculation eroding his accumulated wealth and was compelled to raise debts. When transit Rahu formed close aspects with natal Sun in June, 1992, the native resorted to speculation with borrowed money and incurred a loss of more than five lakh of rupees in spite of the clear cut warning to the native to this effect. The burden of the borrowings was so much that it set the stage for the selling of his assets in the form of a residential house during the end of 1993, to enable him to come out of the debt trap. The events timed with the close aspect of transit Ketu to the weak natal Venus. 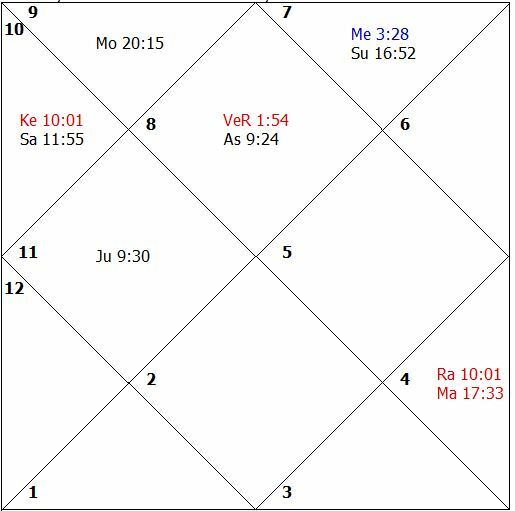 Trends-wise, as well, the sub-periods of Rahu and Jupiter in the main period of Venus had been inauspicious. Male born 10th May, 1951, 0010 Hrs. 78E04 27N54 India. The sign Capricorn rises in the ascendant and the Sun, Jupiter, Rahu and Ketu become functional malefic planets. The functional malefic planet, the Sun, closely afflicts the weak fourth lord in the fourth house, itself. The lord of the fourth house is weak as it is in the state of combustion and old age. Mercury is weak due to the weakness of its dispositor. The functional malefic planet, Jupiter, is closely conjunct with the most effective point of the third house and afflicts the houses occupied and aspected. Saturn is weak due to the weakness of its dispositor and being placed in an afflicted house. The Moon and Venus are weak due to bad placement. Because of the weak and afflicted planets, the native could not create assets in spite of his good job with the banking industry. On the other hand the weakness of the combust lord of the fourth house and the severe affliction of the most malefic planet to the same, created roots for a decerase in assets. This fructified with the investment of money raised through debts against assets in May, 1991, in the stock market when transit Rahu formed a close aspect from the twelfth house with the natal Sun and Mars in the fourth house. The investment substantially declined in June-July, 1992, at the time of the securities scam in the stock market when the transit Rahu from the twelfth house formed close aspect to natal Mercury, the Moon and Venus. Male born 21st November, 1931, 1000 Hrs. 73E05 31N44, India. The sign Sagittarius rises in the ascendant and the Moon, Rahu and Ketu become functional malefic planets. As the Moon is a very fast moving planet, its transit influence is not strong but its frequent impact on the various natal points makes the native touchy and sensitive. The lord of the ascendant is in the eighth house. The lord of the eighth house, the Moon, is in the fourth house. The lord of the third house, Saturn, is in the ascendant. Jupiter is weak as it is placed in the state of old-age in the eighth house. Saturn is weak due to the weakness of its dispositor and being in the old age. The Sun, Mars, Mercury and Venus are weak as they are placed in the twelfth house. All the functional benefic planets are weak. The lord of the eighth house ruling longevity, easy gains and inheritance is strong in degree but is placed in a house afflicted by the Rahu-Ketu axis. Rahu-Ketu axis is close to the most effective points of the houses occupied and afflicts the houses occupied and aspected. Mars, Mercury and Venus are functional benefics and are closely conjunct but their bad placement and weakness have not been able to make a considerable contribution to the life of the native. The absence of slow moving planets as functional malefic planets, the presence of an auspicious but weak combination of the fifth, eleventh and tenth house lords and the closeness of the Rahu-Ketu axis to the most effective point of various houses has made the life of the native average with periodical losses of assets. In September-October, 1949, when transit Rahu was closely conjuct with the natal lord of the eighth house and exactly aspected Mars, Venus and Mercury in the twelfth house, the native suffered loss of valuables in the form of his possessions of precious metals (gold) and precious stones. The investments made by the native in March, 1992, out of his accumulated wealth, when Rahu formed a close conjunction with the most effective point of the natal ascendant, declined and were reduced to a mere 65% in March-April, 1993, when transit Rahu formed a close conjunction with natal Mars, Venus, Mercury and a close aspect to the natal Moon placed in the fourth house. In January, 1986, when Rahu-Ketu axis formed an exact conjunction with the most effective point of the eleventh and fifth houses with exact aspects to the ascendant and the seventh house as well, the native’s wife suffered from severe ill-health giving a lot of mental pain to the native. The native’s wife backbone had to be operated upon, but without any relief. Ketu’s close aspect to the most effective point of the sixth house has given the problem of acidity to the native. 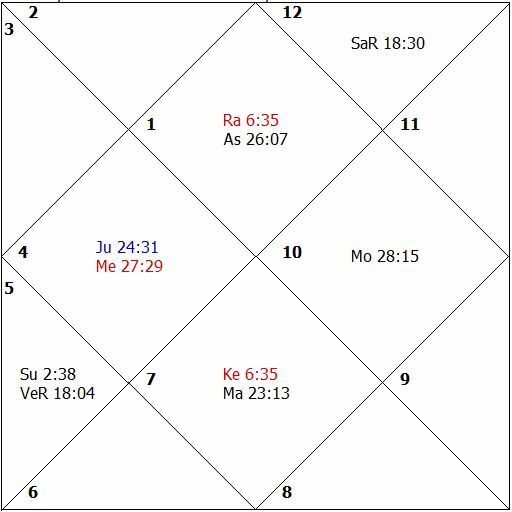 In February-March, 1993, when transit Rahu formed a close conjunction with natal Mars, Mercury and Venus the native experienced weakness, depression, lost job and had no current income. Male born 6th March, 1949, 0805 Hrs. 76E26 31N19, India. The sign Pisces rises in the ascendant and the Sun, Venus, Saturn, Rahu and Ketu become functional malefic planets. Since five out of nine planets are functional malefic planets, the lives of natives born under Pisces are full of pins and pricks. The lord of the second house ruling family life and accumulated wealth is combust and is placed in the house of losses. The weakness of Jupiter has not allowed the native to earn through prominent professions ruled by Jupiter, that is teaching, practicing law, advisory roles, financial consultant, etc. The lords of the sixth and eighth houses are also placed in the house of losses. The major events in this chart have been loss of accumulated wealth, loss of inheritance, loss of spouse and losses on account of thefts. In January, 1993, when transit Ketu formed a close aspect with natal Mercury the income of the native shrunk because of his due payments being held up. He further incurred losses in speculative transactions. When transit Saturn formed a close aspect with natal seventh lord, Mercury, in February, 1987, the native’s wife started suffering from a tumor. The native’s wife was hospitalized in connection with a surgical operation when transit Ketu formed a close aspect with natal Moon in the second house in March, 1988. During the continuance of same close aspect the native underwent a lot of mental tension on account of his wife’s health and children’s care. As the speed of the Rahu was comparatively slow at the end of April, 1988, during the separating aspect of transit Ketu from the sixth house, the native, too met with an accident. Transit Ketu’s close aspect to the significator for wife, Venus, in March, 1992, caused hospitalization of wife. She had to be put on dialysis. The single degree aspect of transit Saturn to the most effective point of the eighth house in November, 1992, saw the end of marital bond due to the death of wife. From September, 1988, to November, 1990, the native had the sub-period of Jupiter in its own main period and then up to May, 1993, the sub-period of Saturn. Jupiter is a weak functional benefic, while Saturn is a functional malefic planet for the native. Male born 28th November, 1928, 2352 Hrs. Srinagar, India. The sign Leo rises in the ascendant and the Moon, Rahu and Ketu are the functional malefic planets. The functional benefic planets, Jupiter, Sun, Venus and Mars are strong in the chart. Mercury is weak as it is combust and placed in the state of infancy, and it is afflicted by the Rahu-Ketu axis. The Moon is weak as it is placed in the state of infancy. Saturn is weak as it is placed in the state of old-age and is combust. Rahu and Ketu afflict all the houses occupied and aspected. The Sun closely aspects the most effective point of the tenth house which blessed the native with high level governmental assignments. The Leo born natives generally acquire higher status in life due to the general significations of the sign Leo. However, when the Sun has a connection with the most effective point of the tenth house, the significant status comes easily. In this case, the Sun aspects the tenth house closely. The lord of the fifth house is placed in the ninth house. All these good and strong placements produce combinations of good fortune. The combustion of Saturn and Mercury, however, weakens these combinations to some extent. From April, 1992, to April, 1993, the native had the sub-period of Mars in the main period of Mercury. Due to the placement of Mars in the eleventh house, the native’s concentration during the sub-period was mainly on income for self and for the organization he was heading. However, the trends were considered favorable by the native when transit Rahu-Ketu axis formed a close conjunction with the most effective points of the ascendant and the eleventh houses. 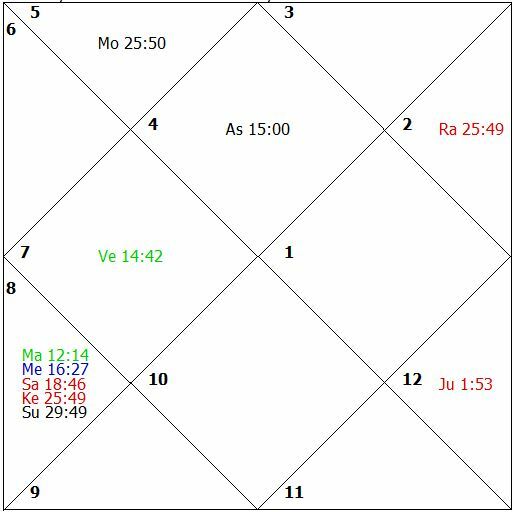 The native was offered opportunities for increased income which he opted for when transit Rahu-Ketu formed a close conjunction with the natal Jupiter. Under Rahu’s influence one’s intelligence does not function properly and one is only concerned with gains without studying the pros and cons and even by manipulating the circumstances. In this case the funds of the organization were invested with the private sector under the portfolio management scheme even after the securities scam of 1992 of the stock market had come to light. The exact conjunction of Ketu with the natal Moon in September, 1992, brought extreme mental pressure on the native with the threat of losing his position held and suffering disgrace. But as Ketu was having normal speed and the functional benefic Jupiter came into exact conjunction with the most effective point of the second house in October, 1992, the native could salvage the distressing conditions. The salvage was possible as the natal Jupiter was strong. Female born 10th October, 1955, 0300 Hrs. Nangal, India. The sign Leo rises in the ascendant and the Moon, Rahu and Ketu are the functional malefic planets. The functional malefic planet, Ketu, closely afflicts the weak lord of the ascendant, the Sun. The Sun is weak due to the weakness of its dispositor. Saturn is weak as it is in the state of old-age and its dispositor is weak. Mercury, Jupiter and Venus are weak as they are placed in the state of infancy. The most malefic planet, the Moon, is strong in its mooltrikona sign and near the most effective point of the twelfth house which protects longevity but harms the house of health due to its close aspect. Though enjoying life, the official status of the native is not that high as in the previous chart as the Sun is weak and does not form a close connection with the tenth house or its lord. 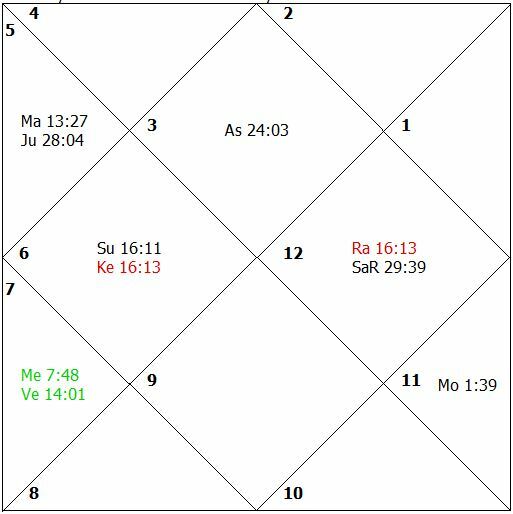 In May, 1988, transit Rahu’s exact aspect to Saturn, the seventh lord, created stress for the husband and he suffered from an accident. He had to be hospitalized. In August/September, 1989, when Rahu in transit was almost static and formed close aspect to the natal Venus and Mercury, the native suffered from a brain hemorrhage and went into a comma. Both Venus and Mercury rule the venous and nervous systems of the body. The native was operated upon on the 12th September, 1989. The close aspect of transit Ketu to the natal Sun in February, 1993, started generating physical trouble to the native. However, the extent was bearable as the native was using a protective Kavach for the weak functional benefic planets. CHART 35 Male born 12th October, 1957, 2015 Hrs. Rohtak, India. The sign Taurus rises in the ascendant and Venus, Jupiter, Mars, Rahu and Ketu are the functional malefic planets. The functional malefic planet, Venus, exactly afflicts the most effective points of the ascendant and the seventh house. The exalted Moon beneficially influences the most effective points of the ascendant and the seventh house. The lord of the fifth house is exalted. The functional malefic planets, Mars and Jupiter, are closely conjunct and afflict each other. The Sun is weak as it is in the old-age. 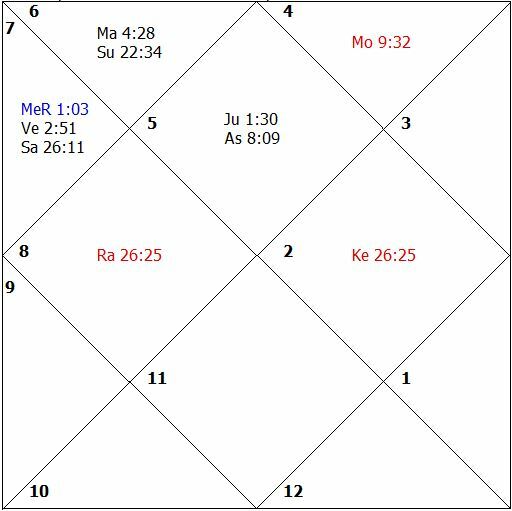 Rahu and Ketu are badly placed but do not cause close afflictions in the chart. The close affliction to the lord of the eighth house caused financial setbacks and health problems to father besides causing obstructions for the native. The close affliction to the lord of the twelfth house caused mental worries and loss of comforts. The weakness of the Sun and affliction to Jupiter have shown the prominent results in this chart. The native had major periods of the Sun, Moon, Mars and Rahu. Of these four planets the Sun and Moon are the only functional benefics and they were operational during his first eleven years of life. Except for this period, the life of the native has been like driving a vehicle, without wheels on a bumpy road. During the main period of Rahu and the sub-period of Mars from October, 1992, to November, 1993, the trends were bad. The transit aspect of Ketu to planets placed in the fifth house caused ill health to the wife. The close aspect of transit Ketu to the natal Sun and its continued impact up to the end of February, 1993, caused extreme ill health to the mother. She was operated on and the operation was unsuccessful causing extreme physical pain for her and mental tension to the native. The weak Sun rules the fourth house signifying mother. Female 10th January, 1969, 1015 Hrs. Delhi, India. The sign Aquarius rises in the ascendant and the Moon, Mercury, Rahu and Ketu are the functional malefic planets. The functional benefic Venus, being yogakaraka, is placed in the ascendant but is weak due to the weakness of its dispositor. The lord of the sixth house is exactly under the influence of the Rahu-Ketu axis in the eighth house indicating chances of severe health problems and conflicts in married life/relationships. Rahu, Ketu and the Moon severely afflict the badly placed, Jupiter. The lord of the ascendant is well-placed but is slightly weak on account of old-age and its dispositor Jupiter is also weak. The lord of the seventh house, the Sun, is weak as it is placed in the state of old-age. Mars is weak as its dispositor is weak. Jupiter and Mercury are weak as they are placed in malefic houses. The weakness of the functional benefic planets were delaying the marriage of the native and all efforts of the parents were proving fruitless in spite of their being affluent and the native being both educated and beautiful. It was at this stage when the astrological help was sought. The native was running the sub-period of Jupiter in the main period of Rahu since December, 1988. The astrological help was sought in early 1990. The analysis of the chart showed that although the trend time was indicative of marriage, the obstructions and failure were the results of the bad placement of the significator for husband whose sub-period was in operation. The propitiatory astrological remedial measures for the functional malefic planets and strengthening measures for the functional benefic planets, Jupiter and the Sun, were suggested. The performance of the astral remedies achieved the desired results when the functional benefic Saturn in transit formed a single degree conjunction with the natal seventh lord, the Sun, in July, 1990, to September, 1990. When functional benefic planets are weak, their transit impact or influence to weak natal functional benefics generally do not produce the desired results. In such cases, it is imperative to make use of astrological remedial measures both propitiatory and strengthening. Female born on 27th September, 1945, 0705 Hrs. Lahore, India. The sign Virgo rises in the ascendant and Saturn, Mars, the Sun, Rahu and Ketu are the functional malefic planets. The lord of the eleventh house, the Moon, is placed in the ninth house and it is strong. Venus ruling status, wealth, throat, speech, eye sight and family is badly placed in the twelfth house and is closely afflicted by Ketu. Mercury ruling the personality in general, health and general status is well-placed in its exaltation sign but is weak due to combustion. Jupiter ruling mother, education, assets, vehicles, domestic peace and confidence is weak as it is in the state of combustion. Mercury and Jupiter are closely afflicted by the functional malefic planet, the Sun. Mars ruling easy gains in life, inheritance, interest in mystical sciences, death and obstructions is well-placed and also causes close affliction to the weak Jupiter, lord of the fourth house. Saturn ruling sound financial position, good health and protection against losses through theft, fire and cheating is weak as it is in the state of infancy. The weakness and affliction of Venus, Jupiter and Mercury delayed the marriage of the native inordinately and these were creating obstructions in her professional matters, as well. When the native was running the sub-period of Mercury in the main period of Saturn, the astrological help was sought from the author. Prior to that all suggested remedies and predictions as per the traditional classical studies and astrologers had shown no success. The horoscope was analyzed based on the Systems’ Approach and propitiatory astrological remedial measures were suggested. After starting the performance of remedial measures, when transit Jupiter formed a close conjunction with natal Mercury in the beginning of October, 1992, it blessed the native with a much awaited promotion in her job. During the transit influence of Jupiter on the most effective point of the second house in November 1993, when simultaneously, both Venus and Mercury were in Libra, the native’s marriage was also fixed and the native ushered in the family life. For expediting the desired significant events not only strengthening astral-remedial measures for weak natal functional benefic planets are necessary but the performance of propitiatory remedial measures for the functional malefic planets are also necessary. Male born 18th September, 1967, 0020 Hrs. Delhi, India. The sign Gemini rises in the ascendant and Rahu and Ketu are the functional malefic planets. The Sun ruling initiative, entrepreneurial nature, courage, the power of understanding and communication, valour, younger brothers and breathing system is weak in the chart as it is in the state of utter infancy. The Moon ruling status, wealth and family is strong and placed in the ninth house. Mars ruling the house of gains, income, friends, elder brothers and fulfillment of desires is weak as it is placed in the house of conflicts. Jupiter ruling partners in life and partners in business, vitality, comforts and life in foreign lands is weak as it is placed in the state of infancy and is closely afflicted by Rahu. Venus ruling the house of emotional happiness, speculation, gains from investments, progeny and higher learning is very weak due to the extreme weakness of its dispositor and the exact affliction from Rahu besides being already in the state of infancy. Mercury ruling mother, education, assets, vehicles, domestic peace and confidence is exalted and strong and is in mutual aspect with the strong lord of the house of fortune in the chart. During the sub-period of Venus in the main period of Saturn, due to the afflictions to weak Venus by Rahu, the planet of cravings, the native entered into a pre-marital relationship and the parents of his beloved were not agreeable for turning the affair into a marriage. As the native was having the operating period of weak Jupiter in his early life, in his childhood he belonged to a very ordinary family. When the first planetary period is from a very weak planet, generally the person is born in a very ordinary family. But, the placement of the lord of the second house, the Moon, in the ninth house, the placement of Mercury in the fourth house and the placement of the ninth lord in the tenth house, all near to the most effective point of various houses, did show chances and trends for spectacular rise in life for the native. The strengthening of weak planets and propitiatory remedial measures for Rahu and Ketu opened the doors of fortune for the native through marriage with his beloved, who belonged to a very rich family enjoying good social status. The marriage was finalized when Jupiter transited the most effective point of the fourth house in November, 1992, and solemnized when transit Jupiter was in close conjunction with natal Mercury ruling and occupying the fourth house in January, 1993. CHART 39 Male born 6th September, 1970, 0630 Hrs. Delhi, India. The sign Leo rises in the ascendant and the Moon, Rahu and Ketu are the functional malefic planets. The Sun ruling personality in general, health and general status is strong in the ascendant. 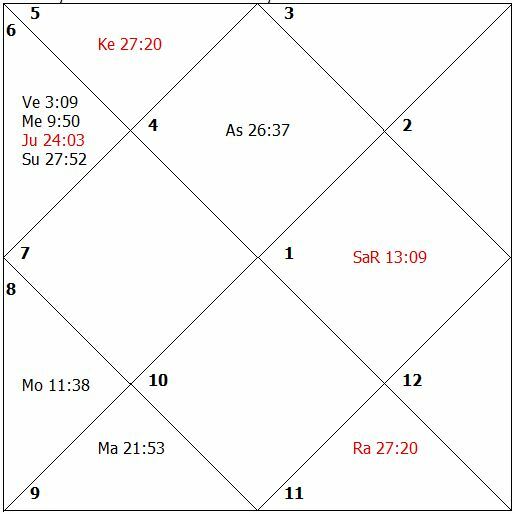 Mars ruling fortune, father, preceptor, religion, pilgrimages, long journeys of short duration and life in foreign lands is well-placed in the chart but is weak as it is in the state of combustion and is exactly afflicted by Rahu-Ketu axis. Mercury ruling status, wealth and family is weak as it is in the state of infancy though it is exalted and placed in the second house, itself. Venus ruling initiative, entrepreneurial nature, courage, the power of understanding and communication, valor, younger brothers and breathing system is strong in the third house. Jupiter ruling the house of emotional happiness, speculation, gains from investments, progeny and higher learning is weak as it is exactly afflicted by Rahu. Saturn ruling partners in life and partners in business, vitality, comforts and life in foreign lands is weak as it is placed in its sign of debilitation besides being in the old-age; it is placed in the ninth house. The Moon ruling the house of losses, expenses and life in foreign lands is placed in the third house. From July, 1991, the main period of the weak Saturn started in this nativity which caused delays in marriage. The significator for wife is strong. The closing conjunction of the functional benefic planet, Jupiter, to the most effective point of the second house ruling family and its close aspect to transit Saturn in January, 1993, resulted into an engagement for marriage. The marriage was to be celebrated in September, 1993. In September, 1993, the functional benefic Jupiter was in exact conjunction with the most effective point of the second house. The benefic transit conjunctions or aspects with the lord or the most effective point of the second, fourth and seventh houses bless the person with engagement/marriage. Though the happy or unhappy events are triggered by the transit influences, yet the trends are totally governed by the natal position of planets. The marital life, as in this case, may not be quite harmonious and long lived in spite of its being celebrated without any delay. As earlier stated both propitiatory and strengthening astrological remedial measures are used in such cases to provide stability to various significations of life including the smooth continuous marital relationship. Female born 27th July, 1968, 0411 Hrs. Delhi, India. The sign Gemini rises in the ascendant and Rahu and Ketu are the functional malefic planets. Rahu-Ketu axis is close to the most effective points of the houses occupied and afflicts the houses occupied and aspected. The Moon ruling status, wealth, throat, speech, eye sight and family is weak as it is in a state of old-age and its moolatrikona sign house is afflicted by Rahu. The Sun is weak due to the weakness of its dispositor. Mars is weak as it is placed in the state of infancy, is debilitated and its dispositor is weak. Venus ruling the house of emotional happiness, speculation, gains from investments, progeny and higher learning is weak due to the weakness of its dispositor and it is closely under the affliction of Rahu. Jupiter ruling partners in life and partners in business, vitality, comforts and life in foreign lands is weak due to the weakness of its dispositor. Mercury ruling mother, education, assets, vehicles, domestic peace and confidence is weak as it is in a state of old-age. Saturn is weak due to the weakness of its dispositor and being in the state of infancy. All the planets are weak. The native has no elder brother and sister and his father had many upheavals in life. When transit Jupiter formed a close conjunction with the most effective point of the second house and Venus placed therein, the native was engaged for marriage. The marriage was solemnized when transit Jupiter formed an exact aspect with the most effective point of the seventh house in December, 1991. Ketu’s close conjunction with the most effective point of the fourth house gave the native obstructions in pursuance of her education due to a change of place of residence. Trend-wise the native was running the sub-period of Saturn in the main period of the weak and afflicted, Venus. Due to the weakness of Saturn and its ruling the ninth house, the father was having a major unfavorable time in his life. Male born 15th April, 1974, 1445 Hrs. Mumbai, India. The sign Leo rises in the ascendant and the Moon, Rahu and Ketu are the functional malefic planets. The Sun ruling the personality in general, health and general status is exalted and well-placed but is weak as it is in a state of infancy, and it is afflicted by Rahu. The functional malefic planet, Moon, ruling the house of losses, expenses and life in foreign lands is badly placed in the chart in the house of conflicts. Mars ruling fortune, father, preceptor, religion, pilgrimages, long journeys of short duration and life in foreign lands is well-placed in the eleventh house but is weak as it is in a state of infancy. Mercury ruling status, wealth, throat, speech, eye sight and family is weak as it is placed in its sign of debilitation in the eighth house. Jupiter ruling the house of emotional happiness, speculation, gains from investments, progeny and higher learning is strong. Venus ruling initiative, entrepreneurial nature, courage, the power of understanding and communication is strong. Saturn ruling partners in life and partners in business, vitality, comforts and life in foreign lands is strong. There are mixed influences in this horoscope. The lords of the third and fifth houses are exactly conjunct in the seventh house. The lords of the seventh and ninth house are closely conjunct with each other and are placed in the house of gains and beneficially influence the most effective points of the eleventh and fifth houses. Some of the prominent events started happening at a young age for the native. Being born to rich parents there is continuous addition to his likely inheritance as he is the only child of his parents. Jupiter’s lordship of the fifth house blessed the native with intelligence. Venus blessed the native with creativity and a flair for writing. 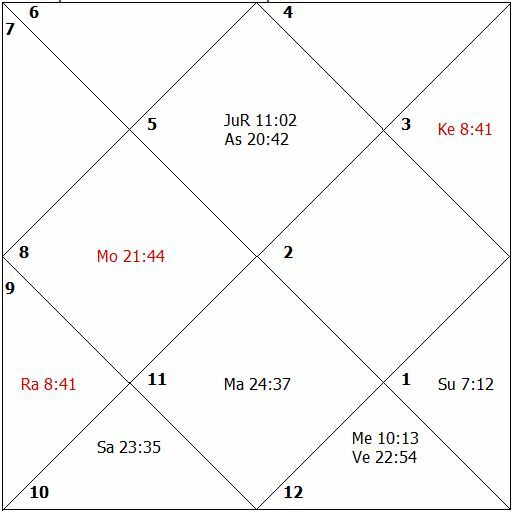 When transit Jupiter formed close aspects with natal Venus and Jupiter in March, 1992, and June, 1992, his creative articles were published in the national level newspapers at a young age of 18 years. The professional achievements of the native are very good and he is very happy. To augment the power of his weak functional benefic planets, the native was provided with a Kavach. Male born 26th March, 1952, 0700 Hrs. Panipat, India. The sign Pisces rises in the ascendant and the Sun, Venus, Saturn, Rahu and Ketu become functional malefic planets. Jupiter ruling the house of profession and fame is well-placed but is weak as it is placed in the state of old-age. Mercury ruling partners in life and partners in business, vitality, comforts and life in foreign lands is well-placed but is weak as it is placed in its sign of debilitation and is in old-age. The good thing is that both functional benefics, Jupiter and Mercury, are closely conjunct with each other. The Sun ruling sound financial position, good health and protection against losses through theft, fire and cheating is well-placed but debilitated in navamsa. Mars ruling status, wealth and family is badly placed but influences the most effective points of eleventh, second, third and eighth houses favorably. The Moon ruling the house of emotional happiness, speculation, gains from investments, progeny and higher learning is well-placed but weak as it is combust and debilitated in navamsa, being therefore closely afflicted by the functional malefic planets, the Sun and Saturn. Venus ruling easy gains in life, inheritance, interest in mystical sciences, death and obstructions is badly placed in the chart. Rahu and Ketu do not cause close afflictions in the natal chart. The weakness of Jupiter and Mercury created ups and downs in the professional life of the native but the placement of Jupiter close to the most effective point of the ascendant along with Mercury and close aspect of Mars to its own house most effective point blessed the native with a senior position with the government. From August, 1981, to July, 1983, Jupiter formed auspicious close aspects with planets placed in the ascendant and the most effective points of the second house, ascendant and the third house while transiting in the seventh, eighth and ninth houses. These aspects matched with the native’s appearing in examinations and interviews for senior management positions and blessed him with success. Male born 18th February, 1951, 1932 Hrs. Delhi, India. The sign Leo rises in the ascendant and the Moon, Rahu and Ketu are the functional malefic planets. The Sun ruling the personality in general, health and general status is well-placed but is weak due to the weakness of its dispositor. Mars ruling fortune, father, preceptor, religion, pilgrimages, long journeys of short duration and life in foreign lands is well-placed in the chart and is closely conjunct with Venus ruling the third house. This confluence of planets provides good initiative to the native for a progressive career and status but these planets suffer some setbacks due to the close affliction of Rahu-Ketu axis and the weakness of their dispositor. Jupiter ruling the house of emotional happiness, speculation, gains from investments, progeny and higher learning is well-placed but is again closely conjunct with Rahu and has a weak dispositor. The Moon ruling the house of losses, expenses and life in foreign lands is well-placed but is in the state of old age and under the close affliction of Rahu. Mercury ruling status, wealth and family is badly placed in the chart and is weak. 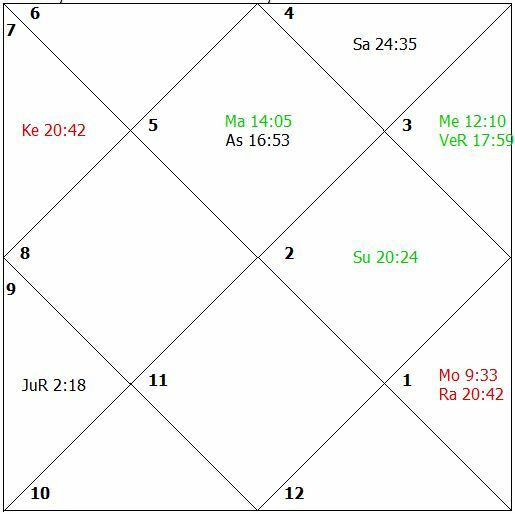 The Rahu-Ketu axis is close to the most effective points of the houses occupied and afflicts the houses occupied and aspected. The functional malefic planet Moon also afflicts the most effective point of the fifth and eleventh houses. The above planetary influences significantly played their role in the life of the native with loss of income, income from foreign sources, income through communication and research work, setbacks in career, conflicts, acquiring high status, international recognition, etc. The timing of the unfavorable events perfectly matched with the transit effects of the functional malefic planets, Rahu and Ketu. When Rahu formed a close conjunction with the most effective point of the fourth house in December, 1992, and January, 1993, the native lost assets of life including jewelry and a provident fund earned so far. In September, 1991, when Ketu formed exact conjunction with the most effective point of the eleventh house, the native lost his source of income. He left his job for venturing into business of consultancy services. When Jupiter formed a close aspect to the natal lords of the third and fifth houses in August and September, 1980, the native sent his research work to the American Universities. His thesis was accepted abroad and published when the functional benefics Saturn and Jupiter formed close conjunction with each other in the second house as well as with natal Saturn in October, 1980, and November, 1980. The native was robbed of material possessions due to his faulty decisions under the close afflictions of Rahu-Ketu axis to natal Jupiter, Venus, Mars and the most effective point of the houses of their location, and the placement of the lord of the second house in the sixth house. Male born 21st March, 1955, 0005 Hrs. Mumbai, India. The sign Scorpio rises in the ascendant and Mars, Venus, Rahu and Ketu are the functional malefic planets. The Sun ruling the house of profession and fame is strong and placed in the fifth house. The strong Moon ruling fortune, father, preceptor, long journeys of short duration and life in foreign lands is placed in the third house ruling entrepreneurship and communications. The Moon is close to the most effective point of the third house and closely influences both third and ninth houses. Mars ruling sound financial position, good health and protection against losses through theft, fire and cheating is strong and placed in its own mooltrikona sign in the sixth house. Mercury ruling the house of gains and income is weak due to the weakness of its dispositor and is closely afflicted by the aspect of Ketu from the eighth house. Jupiter ruling status, wealth and family is weak as it is placed in the malefic house ruling obstructions and is in old-age. Venus ruling the house of losses, expenses and life in foreign lands is placed in the third house of entrepreneurial initiatives in the chart and creates the chances of losses in investment decisions. Saturn ruling life in native place, domestic peace and confidence is placed in the twelfth house in the state of exaltation and is closely aspected by the lord of the second house, Jupiter, indicating native’s status and residence in foreign lands. All the corporate expansion plans of the native in the sub-period of Venus in the main period of Jupiter proved failures and the native lost huge amounts in arranging and promoting the unsuccessful public issues. In February, 1991, the native came into contact with the author in connection with advice for overcoming his failures in the field of corporation expansion. Both propitiatory and strengthening astrological remedial measures were advised the performance of which brought success to the native. The auspicious timings for new ventures were also suggested. The implementation of corporate expansion plans coinciding with the formation of close conjunction of transit Jupiter with the most effective point of ninth house and the close aspect to the natal Moon and the most effective point of the natal ascendant in June, 1991, and July, 1991, in the sub-period of the Sun, proved successful and highly advantageous. CHART 45 13th September, 1951, 0030 Hrs. Delhi, India. The sign Gemini rises in the ascendant and Rahu and Ketu are the functional malefic planets. The Sun ruling initiative, entrepreneurial nature, courage, the power of understanding and communication and writing is well-placed in the third house itself. The Moon ruling status, wealth and family is weak as it is badly placed. Mars ruling the house of gains, income and fulfillment of desires is weak but well-placed. The close mutual aspect of the Moon and Mars is very good and indicates gains of status in life. Mercury ruling mother, education, assets, vehicles, domestic peace and confidence is placed in the third house ruling communications. Venus ruling the house of emotional happiness, speculation, gains from investments, progeny and higher learning is well-placed in the third house. The close conjunction of Venus with Mercury in the third house gives flair for creative writing, good imagination and intellectual pursuits. Saturn ruling fortune, father, preceptor, religion, pilgrimages, long journeys of short duration and life in foreign lands is well-placed in the chart but is weak as it is in its sign of debilitation in navamsa. Jupiter ruling partners in life and partners in business, vitality, comforts and life in foreign lands is strong in the tenth house and gives rise to Hamsa yoga for name and fame. Jupiter also gives spiritual pursuits and the knowledge of the divine science. The native took birth in a family with limited resources as the lord of the ninth house is weak and the most effective point of various houses including the ninth house are under the close influence of Rahu-Ketu axis to some extent. The native was born during the main period of the badly placed, Moon. The close conjunction of the fourth and fifth lords in the third house, the lord of the third house in the third house, the strong Jupiter in the tenth house and the mutual aspect of second and eleventh lords were indicative of significant rise in life which fructified with the onset of the main period of Jupiter. The basic areas were the writing, holding senior position with government, analytical work and the recognition of creative contributions. In July, 1968, at the age of 17 years the native compiled a book on devotional songs. This was triggered by transit Jupiter forming exact conjunction with the lords of the fourth and fifth houses in the third house followed by conjunction of transit Jupiter with the third lord, the Sun, in September, 1968. In July, 1974, when transit Jupiter formed a close aspect to the third lord, the Sun, the native’s views on a very sensitive national issue were published in a national newspaper. In April, 1988, to June, 1988, when transit Jupiter formed close aspect to the natal Sun, Mercury and Venus, in the third house, the native authored a book which was widely accepted by the target audience. The close conjunction of transit Jupiter with natal Venus and Mercury in May, 1992, in the third house again gave rise to publication of the research and creative work of the native in the form of a book. Male born 11th May, 1962, 0353 Hrs. 5E23 43N19, Time Zone -0100 Hrs. The sign Pisces rises in the ascendant and the Sun, Venus, Saturn, Rahu and Ketu become functional malefic planets. Mars ruling status, wealth and family is placed in the ascendant, influencing the houses occupied and aspected. The Sun ruling sound financial position, good health and protection against losses through theft, fire and cheating is well-placed in the chart. Jupiter ruling the house of profession and fame is badly placed and additionally weak due to the weakness of its dispositor. 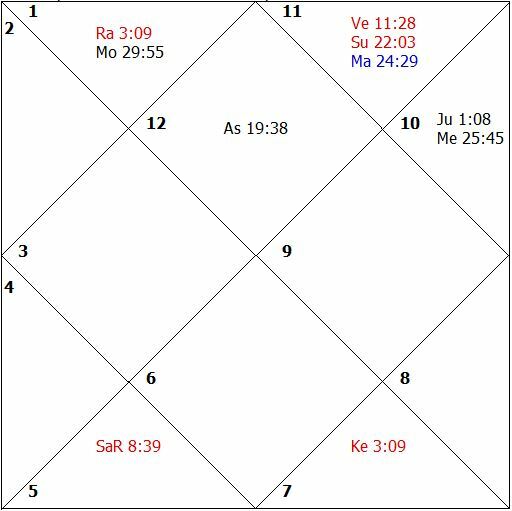 Saturn ruling the house of losses, expenses and hospitalization is severely afflicted in the chart by the Rahu-Ketu axis, and is hence weak. Venus ruling easy gains in life, inheritance, interest in mystical sciences, death and obstructions is closely afflicted by Ketu. Mercury ruling partners in life and partners in business, vitality, comforts and life in foreign lands is weak as the most effective point of its mooltrikona sign house is under the exact affliction of Ketu. 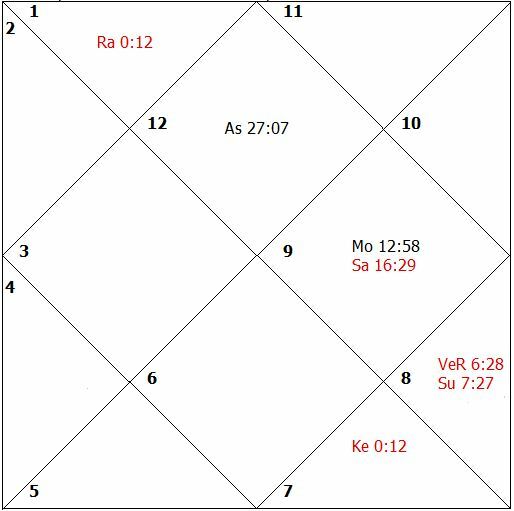 The Moon ruling the house of emotional happiness, speculation, gains from investments, progeny and higher learning is placed in its own house in the chart but is weak as the most effective point of the house is closely afflicted by Rahu-Ketu axis. The Rahu-Ketu axis is close to the most effective points of the houses occupied and exactly afflicts the houses occupied and aspected. 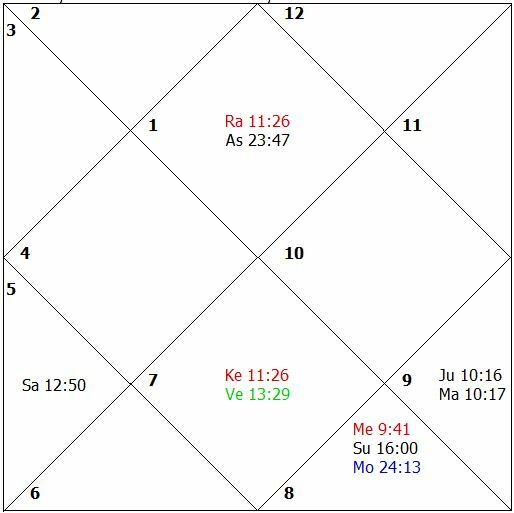 The significant issue in this chart is the close affliction of the two indicators of longevity and the close affliction of Rahu-Ketu axis telling upon the health and longevity of the native. Such charts result in retarded growth, chronic or cancerous diseases shortening the life span depending upon the periods in operation. At the time of birth the native was in the main period of Mercury which was followed by the main period of Ketu causing afflictions in the chart and Venus which is also closely afflicted by Ketu. The main period of Mercury did not cause retardation as Mercury, though afflicted, is a functional benefic, placed in the third house and quite near to the most effective point of the third house. The native kept persistent ill-health and had obstructions in the smooth operation of his career due to the weakness of Jupiter. 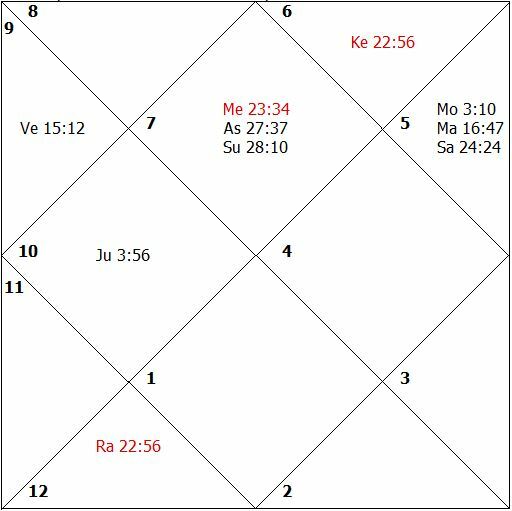 When the Rahu-Ketu axis formed a close conjunction with the most effective points of various houses in the end of 1991 and Ketu’s close aspect to natal Jupiter in early, 1992, the native was diagnosed to be a case of AIDS. He breathed his last during the sub-period of closely afflicted Saturn in the main period of Venus, the afflicted lord of the eighth house, in May, 1993. The stationary Rahu-Ketu axis was causing severe afflictions in the natal chart to the most effective point of various houses and the planets Saturn, Mercury, Moon and natal Rahu-Ketu axis. Female born 28th January, 1990, 0312 Hrs. Delhi, India. The sign Scorpio rises in the ascendant and Mars, Venus, Rahu and Ketu are the functional malefic planets. Jupiter ruling status, wealth, family and right eye is weak as it is placed in the eighth house. Jupiter is closely afflicted by the functional malefic planet, Mars. Saturn ruling mother, education and assets is weak due to the weakness of its dispositor and is closely afflicted by the most malefic planet, Venus. Mars ruling good health and protection against losses is weak due to the weakness of its dispositor. The Moon, ruling right eye in the case of women, is weak as it is in the state of old-age besides being closely afflicted by the Rahu-Ketu axis. The Sun, ruling left eye in the case of women, is strong. Mercury ruling the house of gains, income and fulfillment of desires is weak due to the weakness of its dispositor. 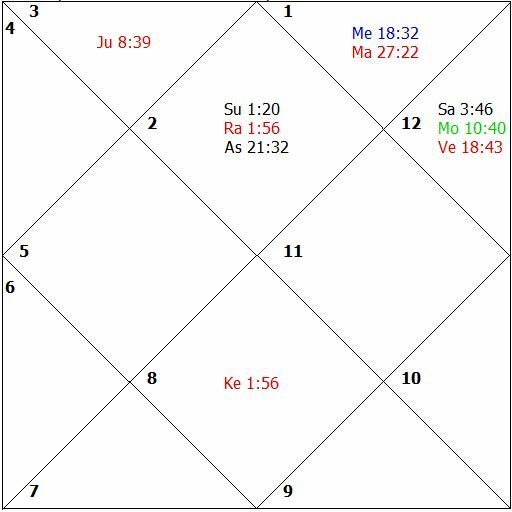 Venus ruling the house of losses, expenses and life in foreign lands besides being Karaka for vision and ruling left eye in this chart is weak as it is placed in the state of utter old-age. Both Jupiter being lord of the second house and Venus being lord of the twelfth house ruling right and left eyes, respectively, are weak in the chart. At the time of birth the native was in the main period of Mars, which is closely afflicting the weak lord of the second house. During the sub-period of the other functional malefic planet placed in the second house, it resulted in weak eye sight in the case of right eye. In the beginning of the sub-period of Ketu, Ketu’s transit over natal Jupiter in April, 1992, aggravated the problem. In the sub-period of Venus, Ketu’s close aspect to the natal Moon in January-February, 1993, necessitated operation at such a young age. A man enjoys a good reputation and becomes famous through his profession and contributions. Professional success and fame are governed by the lords of the ascendant, the second, third and tenth houses and the planets, the Sun and Jupiter. The weakness of these planets in the natal chart and/or in the transit and their coming into the zone of close conjunctions/aspects with functional malefic planets, result in the loss of reputation. This can come in suddenly even without being provoked. To guard against loss of reputation one has to strengthen the functional benefic planets being lords of the ascendant, second, third and tenth houses, the Sun and Jupiter and also must perform propitiatory astrological remedial measures. I brought this reference here as in the past even personalities associated with the propagation of the divine science of Astrology had to confront loss of reputation and/or coming into unnecessary and unprovoked controversy with or without self-involvement. For loss of reputation due to immoral involvements, we have to study the ninth and fourth houses, as well. The fourth house, inter alia other things, rules the character and the ninth house rules the dharma.